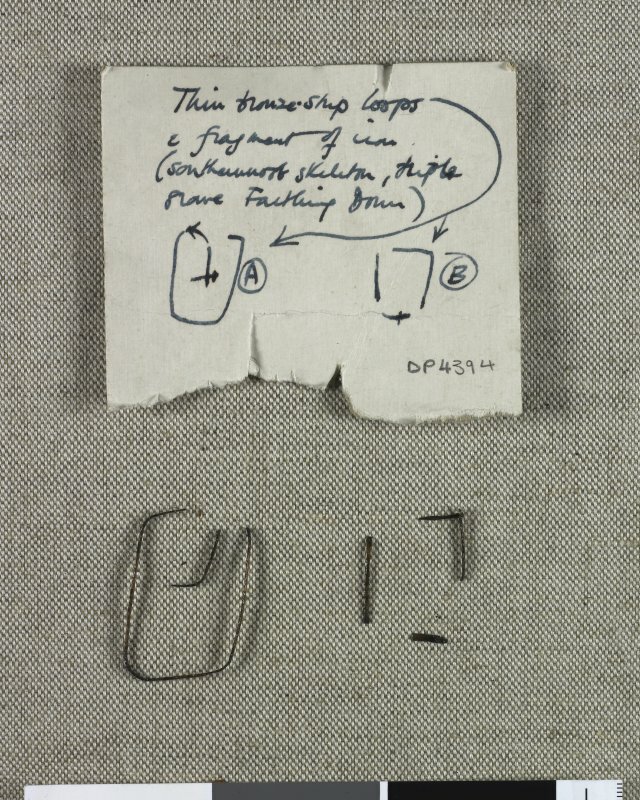 Digital copy of artefact photograph: Thin bronze strip loops and a fragment of iron from the southernmost skeleton of a triple grave. DC 43993. 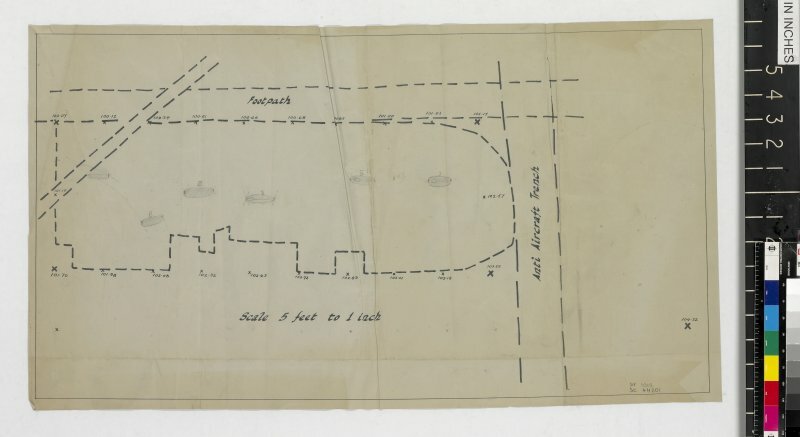 Plan of grave containing triple interment. DC 43992. 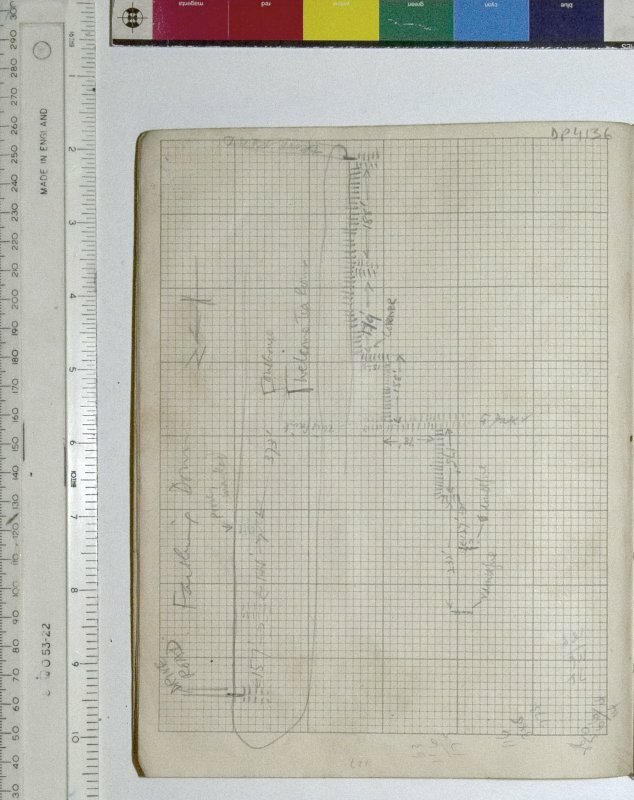 Section drawing titled Farthing Down Fieldway, North of Barrow Group A.
DC 44201. 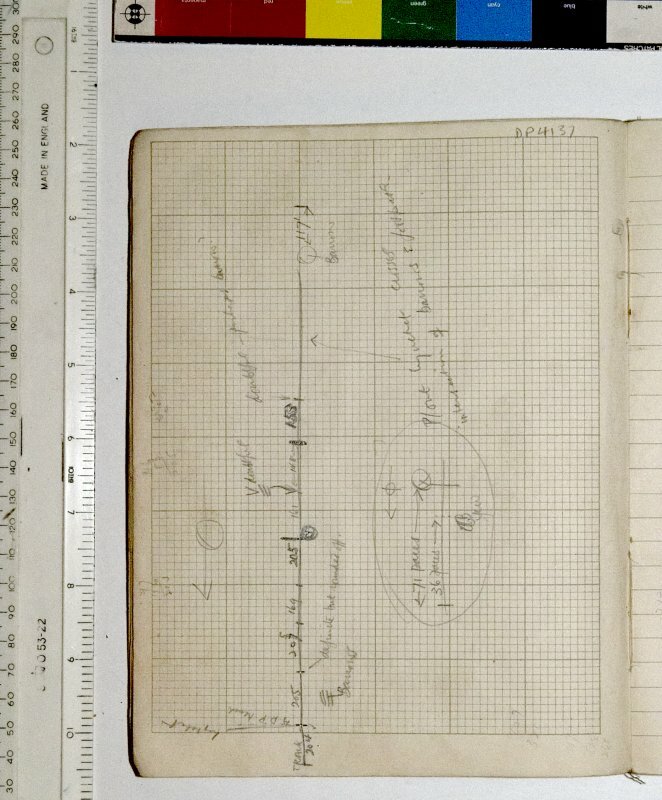 Mechanical copy of plan showing area of an excavation area with the locations of graves I-V marked in pencil. DC 44203. 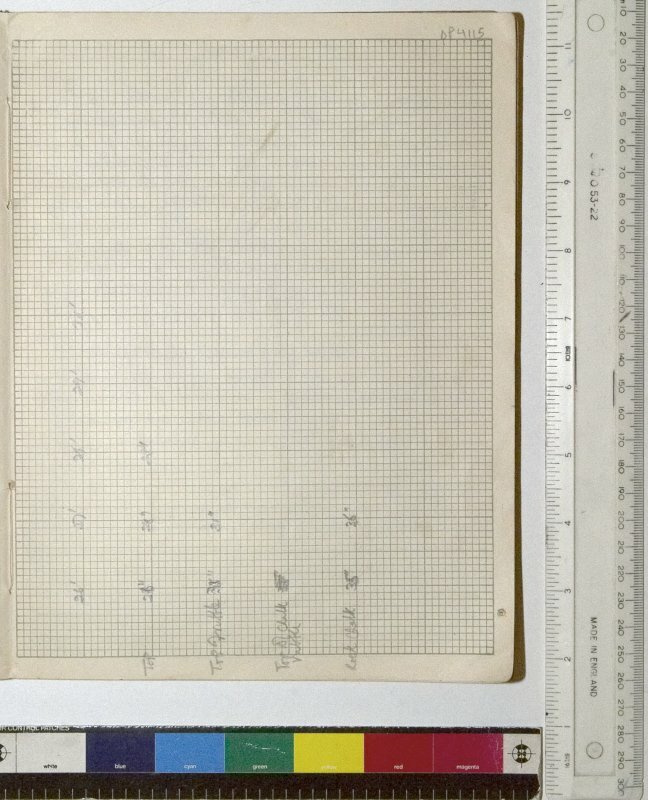 Mechanical copy showing survey grid marked with the location of three barrows and pencil annotations. DC 44224. 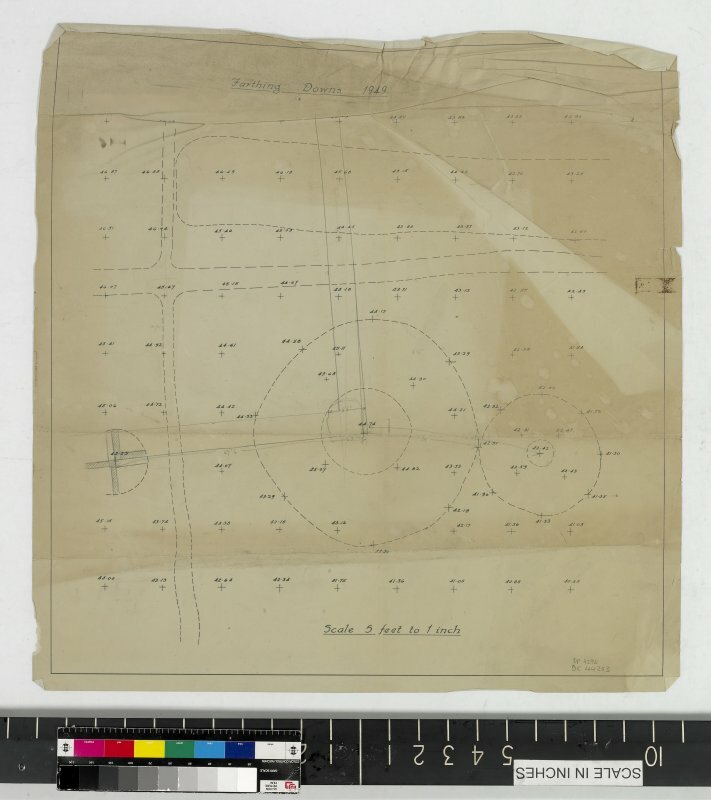 Sketch plans of Graves 9 and 10 from Cane Hill, near Farthing Down. MS2281/29. 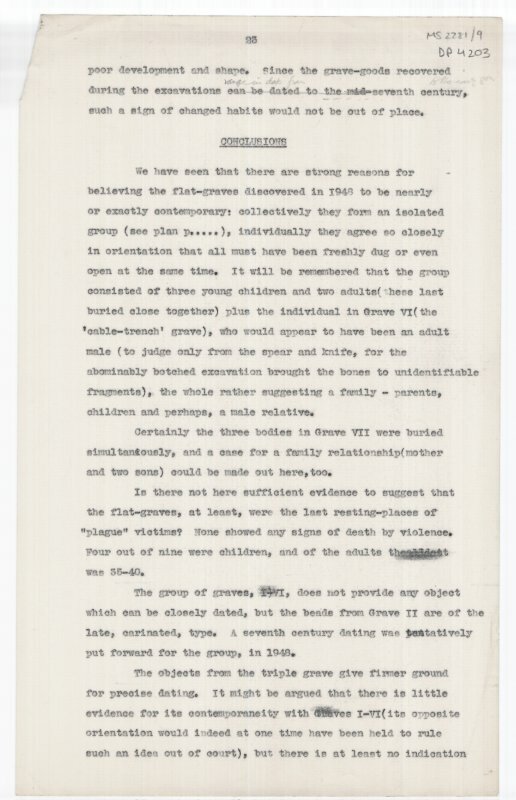 Typed manuscript and 3 sketches by Neville Boyling entitled 'Farthing Downs. Coulsdon. Surrey. 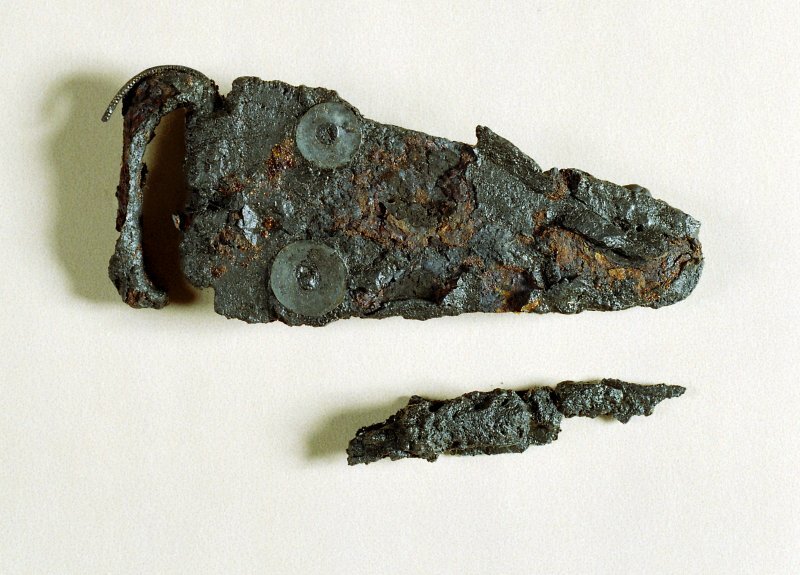 Presumed Anglo-Saxon Find. Jan. 20. 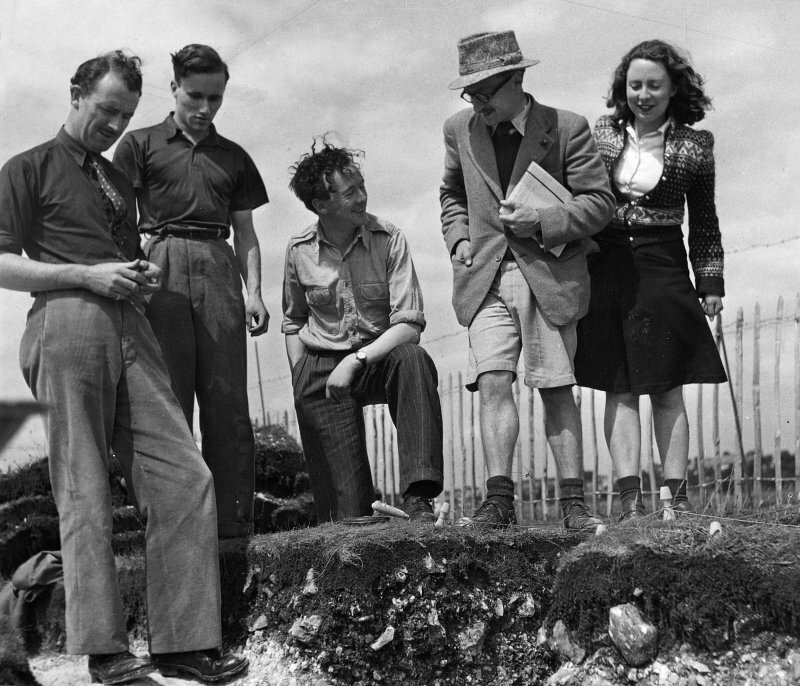 1939.' 6 of 6 sides. MS2281/29. 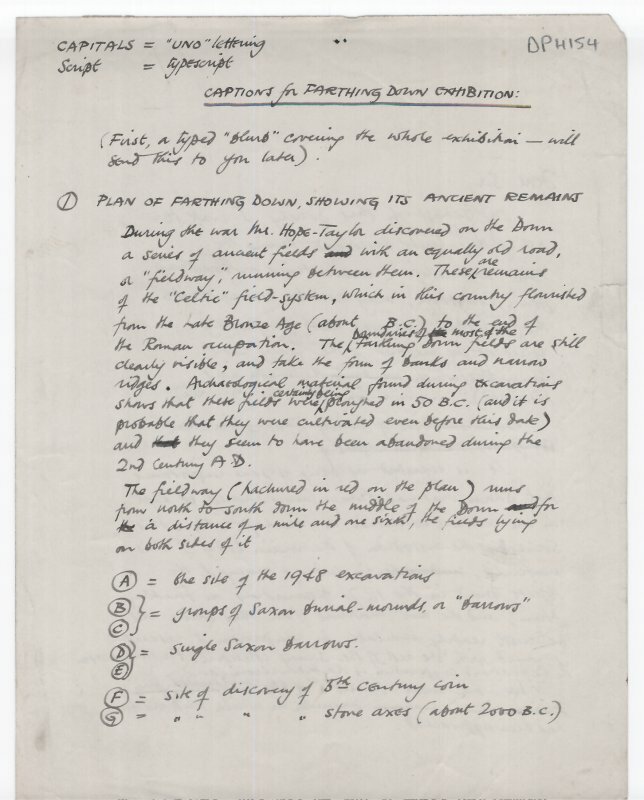 Typed manuscript and 3 sketches by Neville Boyling entitled 'Farthing Downs. Coulsdon. Surrey. 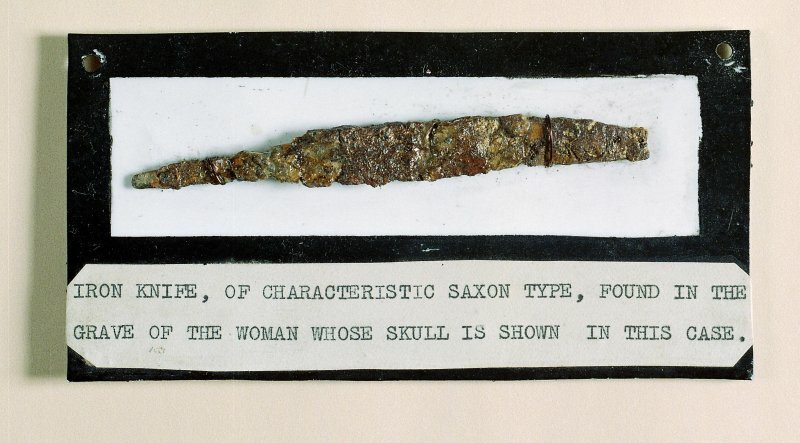 Presumed Anglo-Saxon Find. Jan. 20. 1939.' 2 of 6 sides. S2281/14. 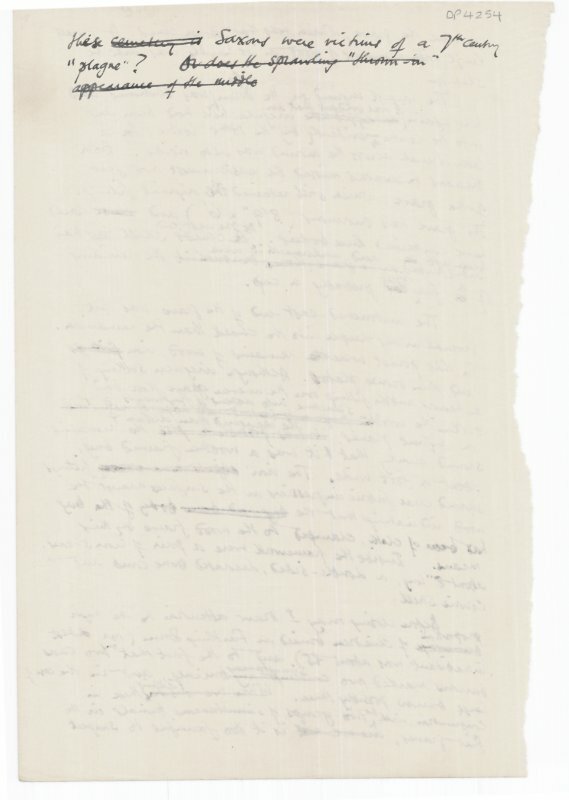 Handwritten manuscript entitled 'Article for the Archaeological Newsletter. September 1949'. 6 of 6 sides. S2281/14. 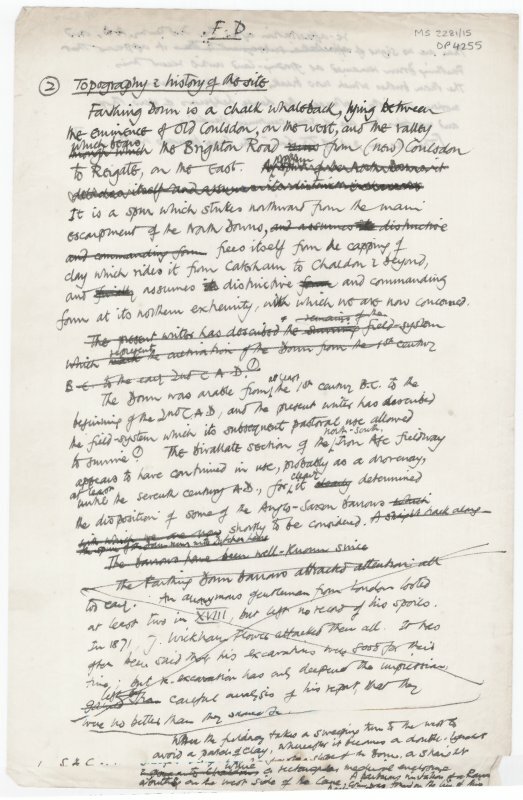 Handwritten manuscript entitled 'Article for the Archaeological Newsletter. 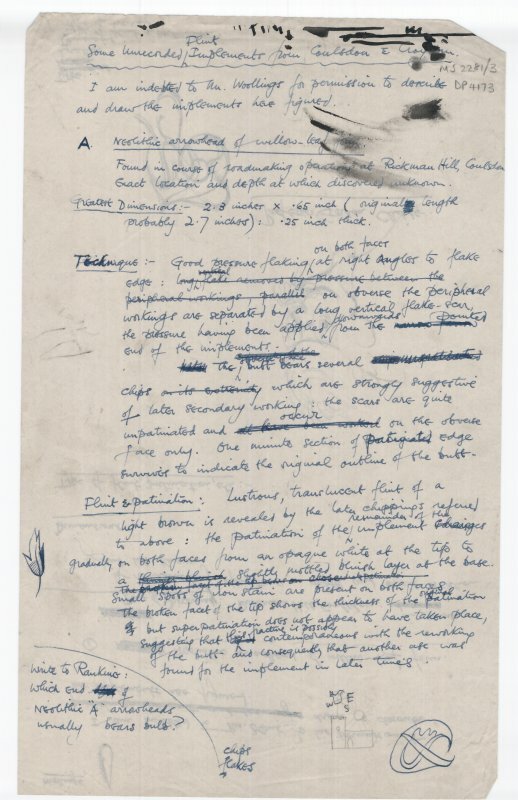 September 1949'. 2 of 6 sides. S2281/9. 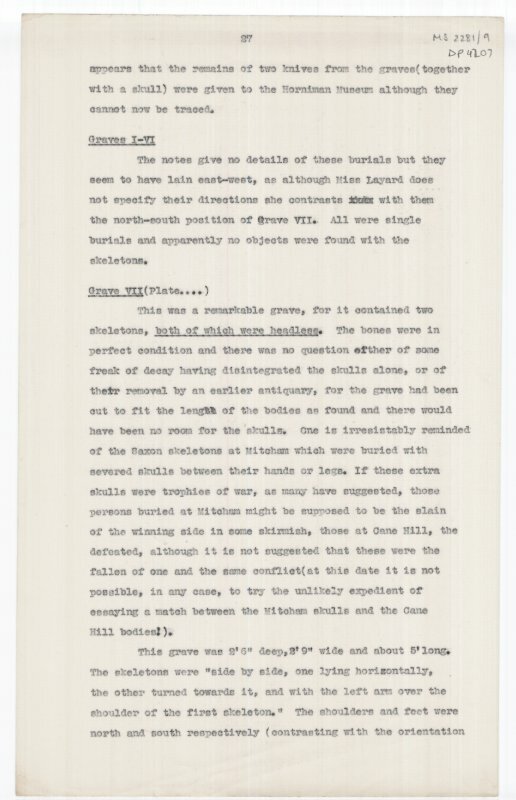 Typed manuscript with edits in pen entitled 'Excavations in the Saxon Cemetery on Farthing Down, Coulsdon'. 20 of 29 sides. S2281/9. 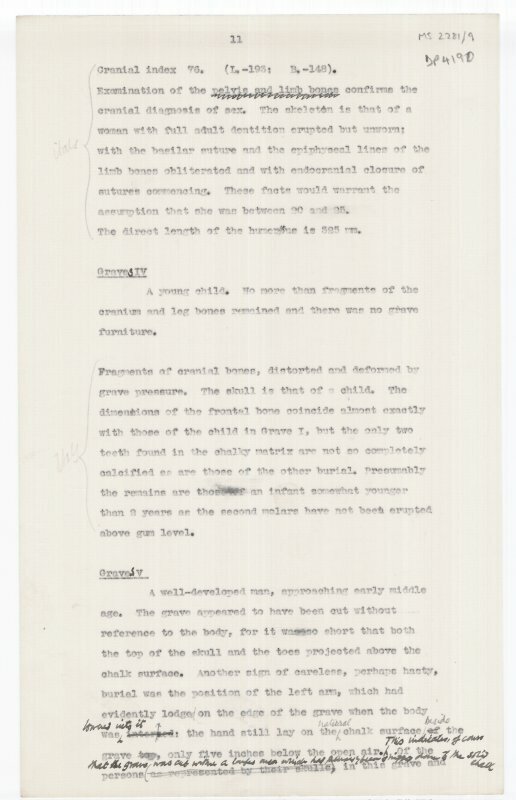 Typed manuscript with edits in pen entitled 'Excavations in the Saxon Cemetery on Farthing Down, Coulsdon'. 11 of 29 sides. S2281/9. 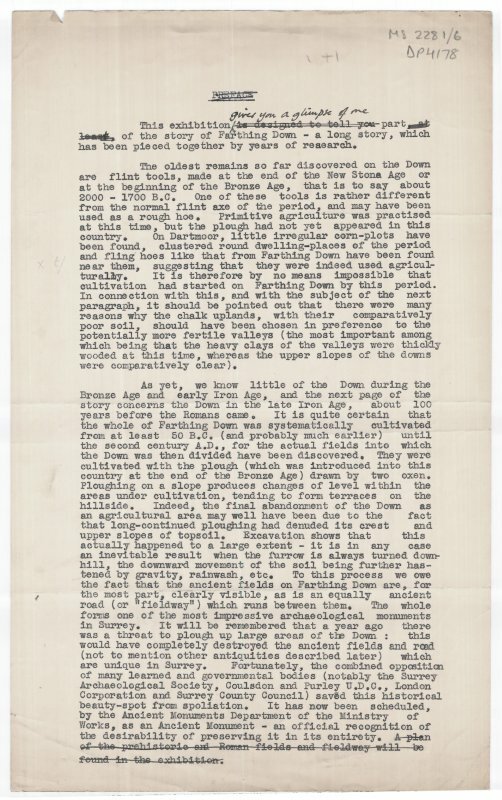 Typed manuscript with edits in pen entitled 'Excavations in the Saxon Cemetery on Farthing Down, Coulsdon'. 21 of 30 sides. S2281/9. 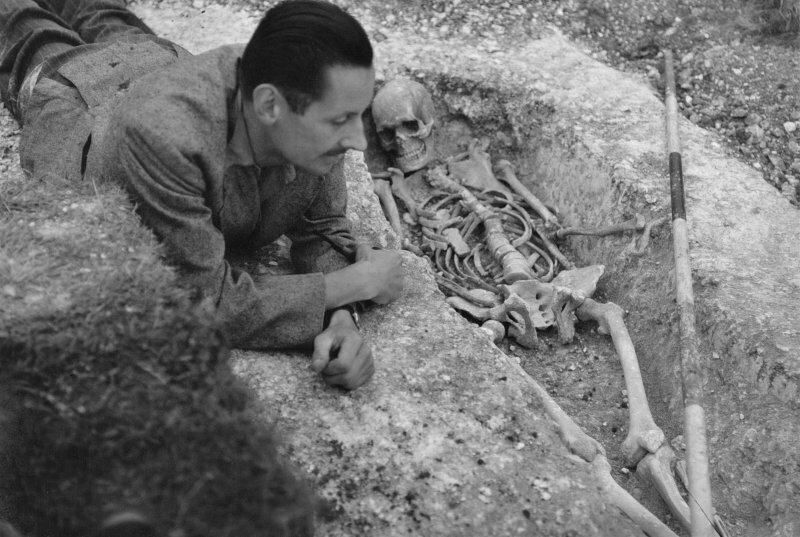 Typed manuscript with edits in pen entitled 'Excavations in the Saxon Cemetery on Farthing Down, Coulsdon'. 18 of 30 sides. S2281/9. 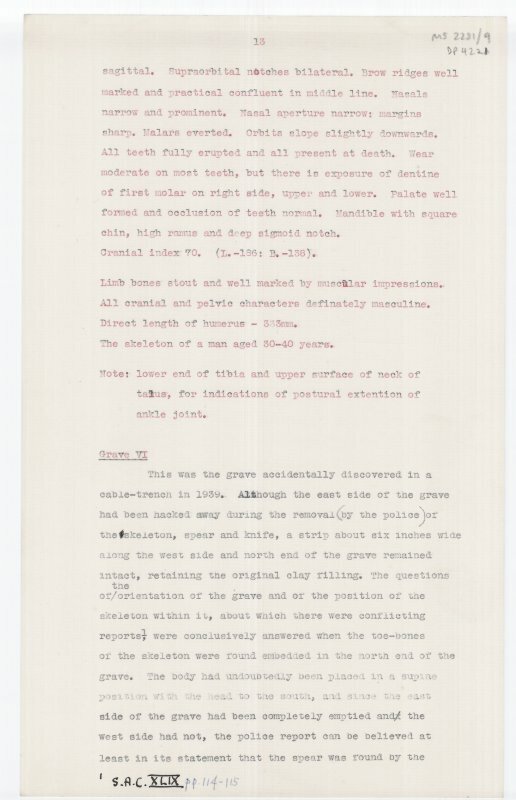 Typed manuscript with edits in pen entitled 'Excavations in the Saxon Cemetery on Farthing Down, Coulsdon'. 16 of 30 sides. S2281/9. 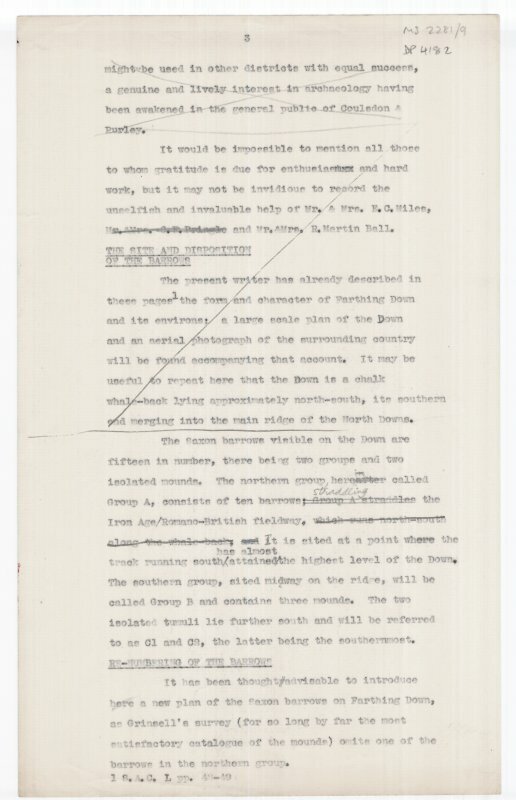 Typed manuscript with edits in pen entitled 'Excavations in the Saxon Cemetery on Farthing Down, Coulsdon'. 11 of 30 sides. S2281/9. 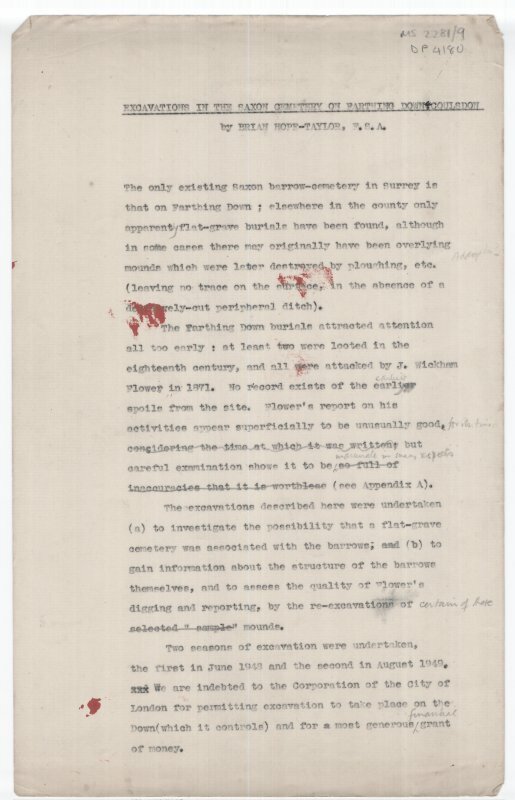 Typed manuscript with edits in pen entitled 'Excavations in the Saxon Cemetery on Farthing Down, Coulsdon'. 10 of 30 sides. MS2281/9. 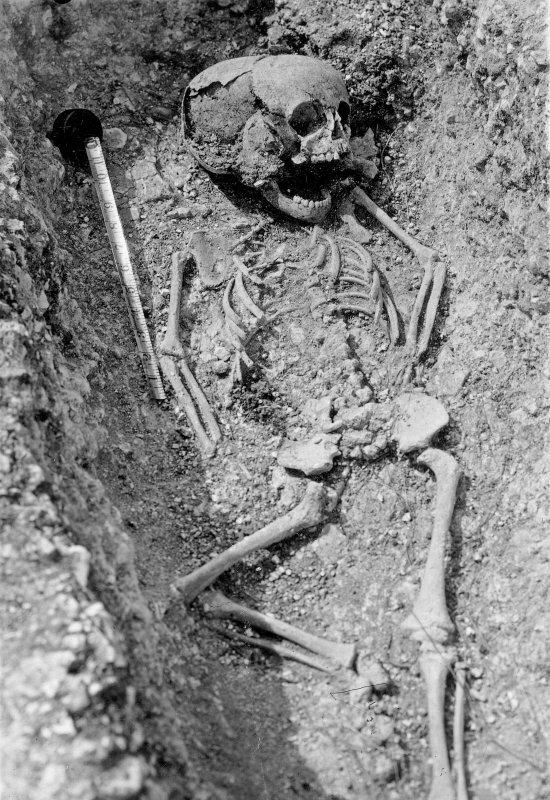 Typed manuscript with edits in pen entitled 'Excavations in the Saxon Cemetery on Farthing Down, Coulsdon'. 6 of 30 sides. MS2281/6. 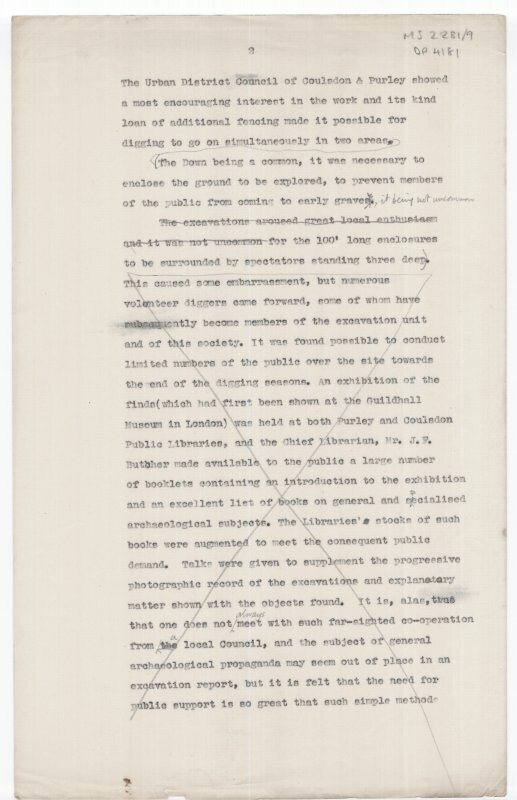 Untitled typed manuscript designed to preface an exhibition of material from Farthing Down. 2 of 2 sides. 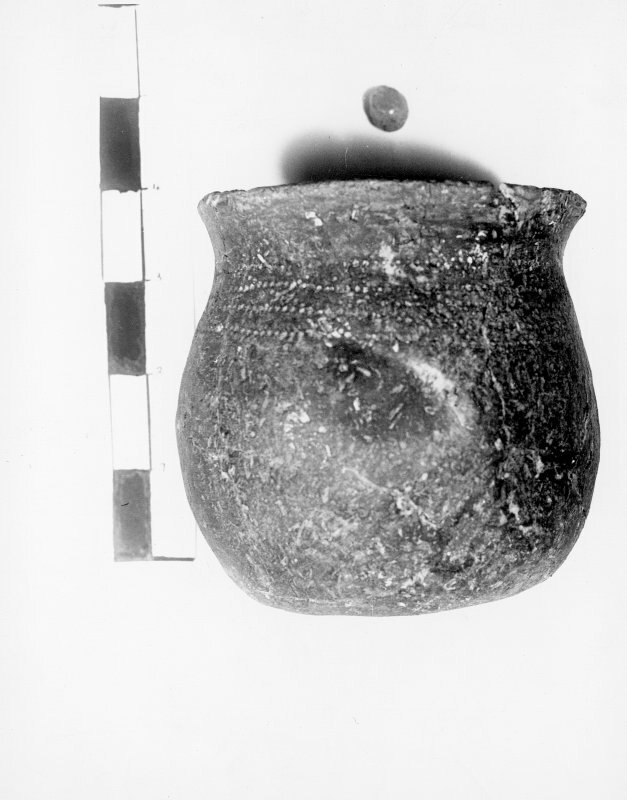 MS2281/25. 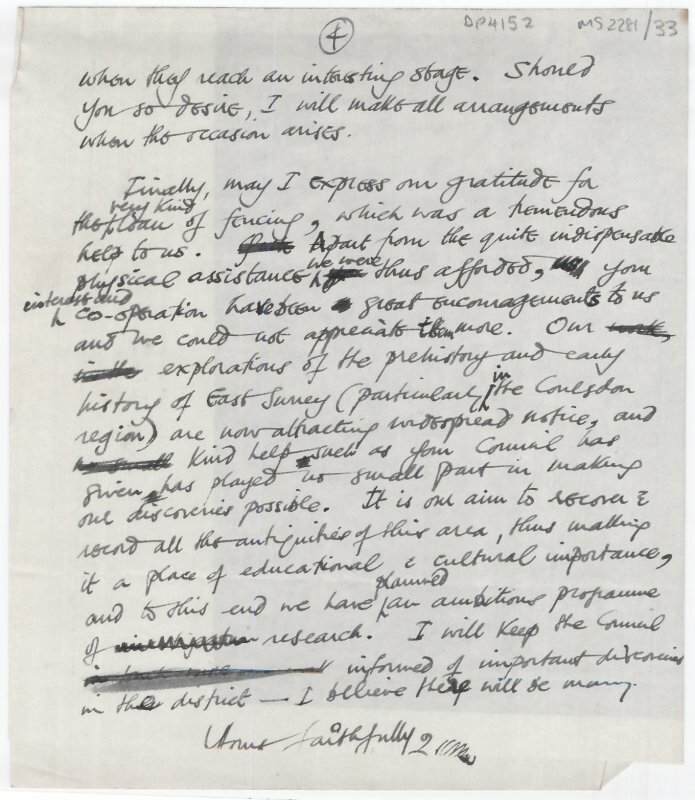 Draft of letter from Hope-taylor to Professor Wood-Jones, Royal College of Surgeons of England, intended to accompany human remains sent for identification. 4 of 6 sides. MS2281/02. 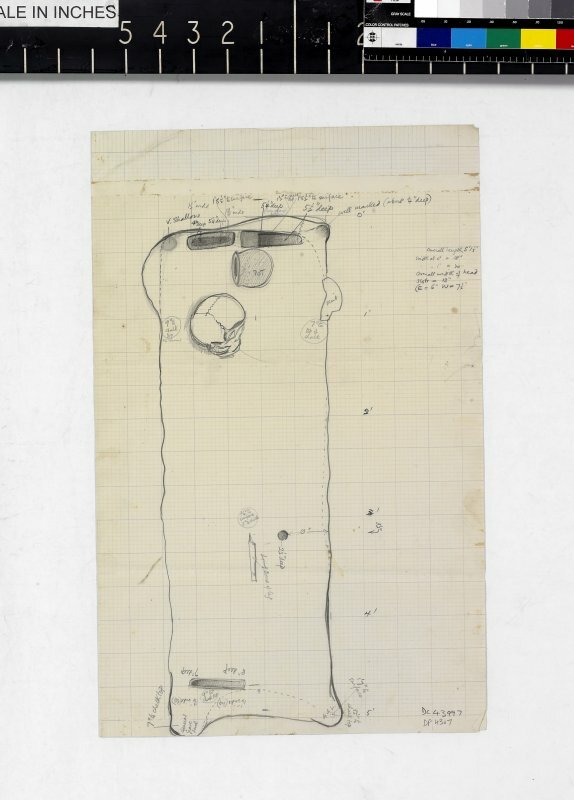 Untitled site notebook. 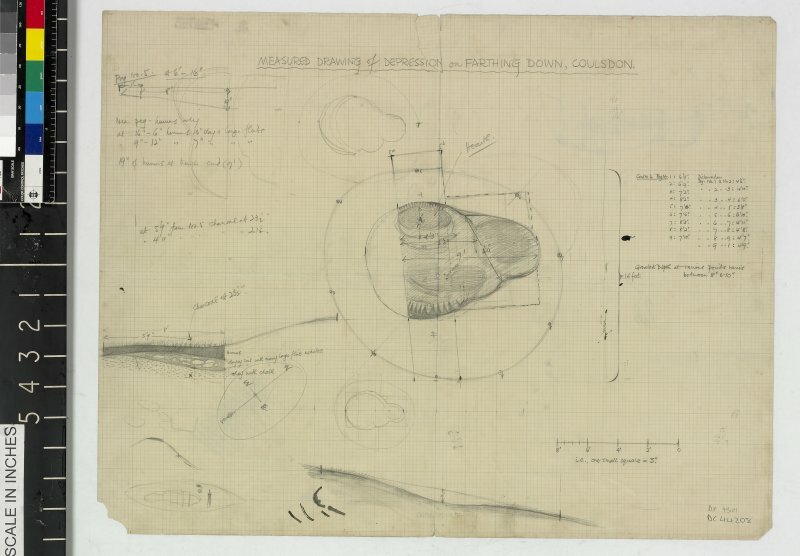 Notes on suggested method of surveying area 'x'. 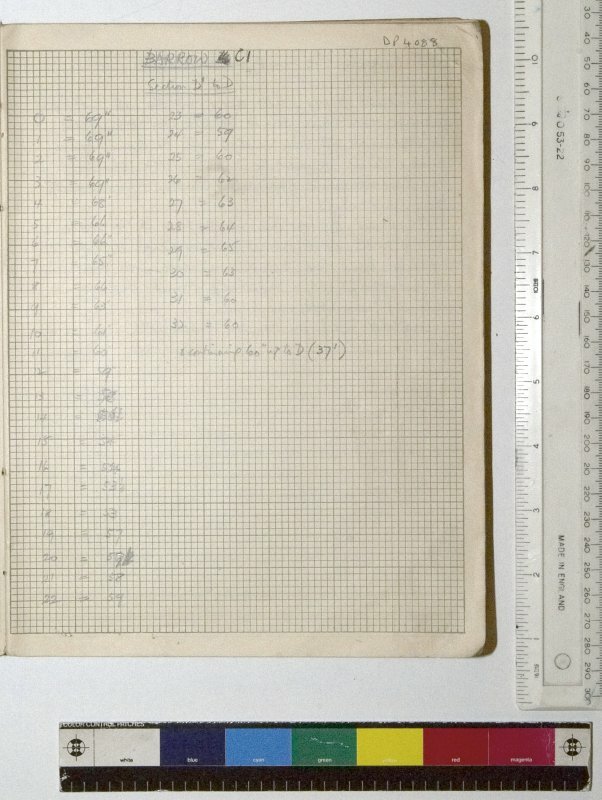 MS 2281/1.Site Notebook entitled 'Farthing Down '48/'49'. 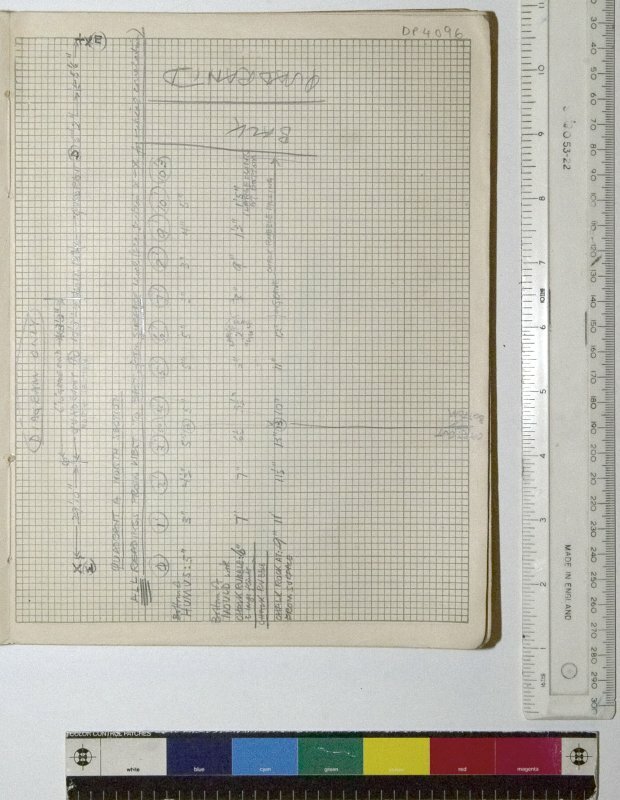 Measurements for Barrow C1, Section D1 to D.
MS 2281/1.Site Notebook entitled 'Farthing Down '48/'49'. 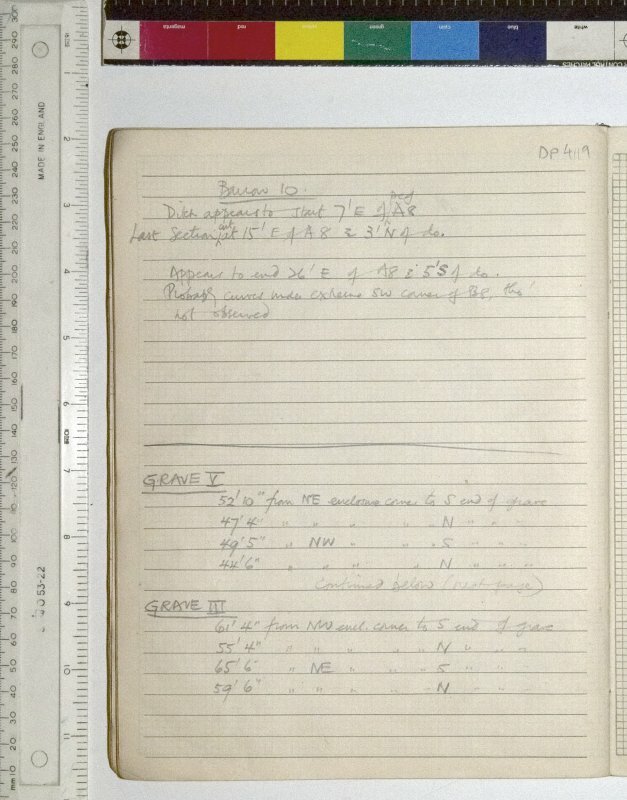 Notes on Barrow B continued in DP4089. 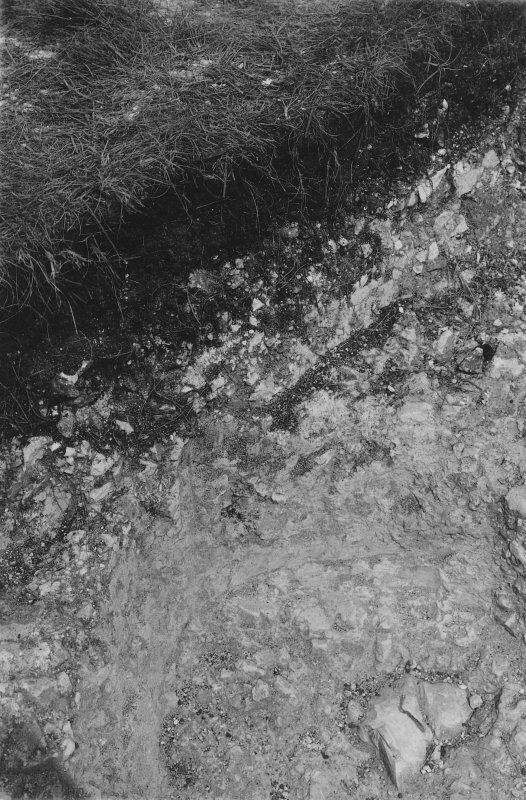 Digital copy of excavation photograph: view of trench. 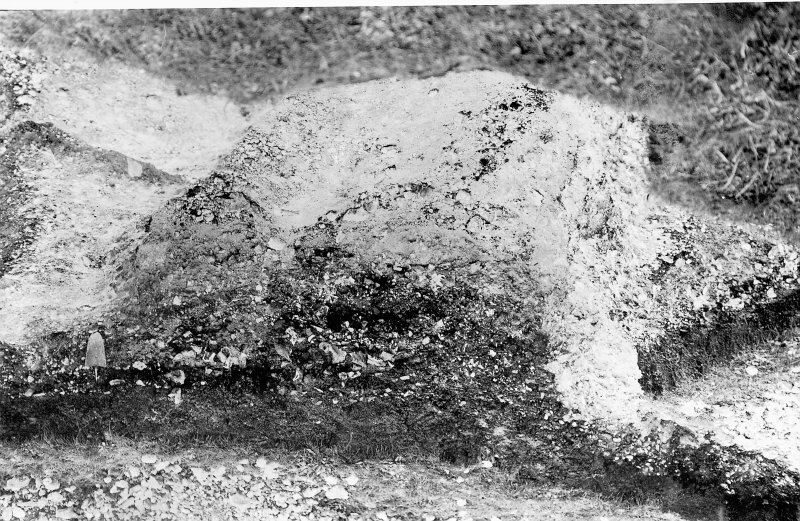 Digital copy of excavation photograph showing an excavated grave cut. 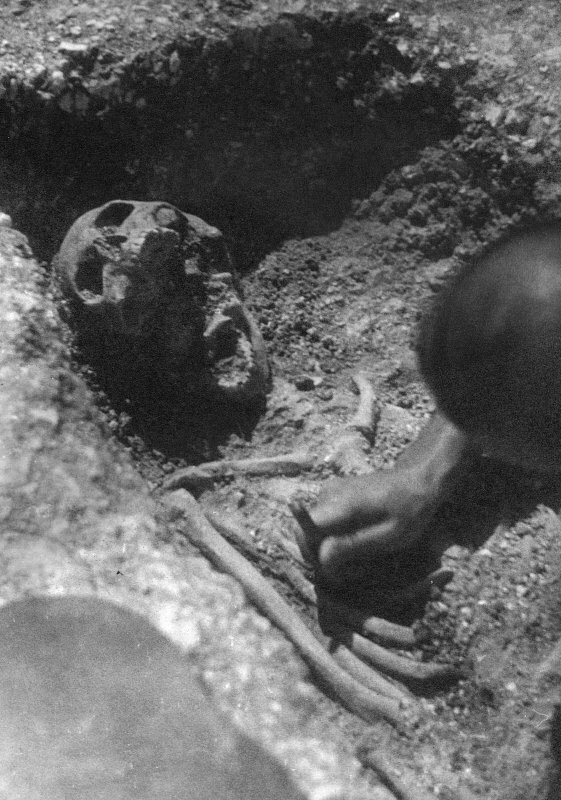 Digital copy of excavation photograph showing a single child interment. 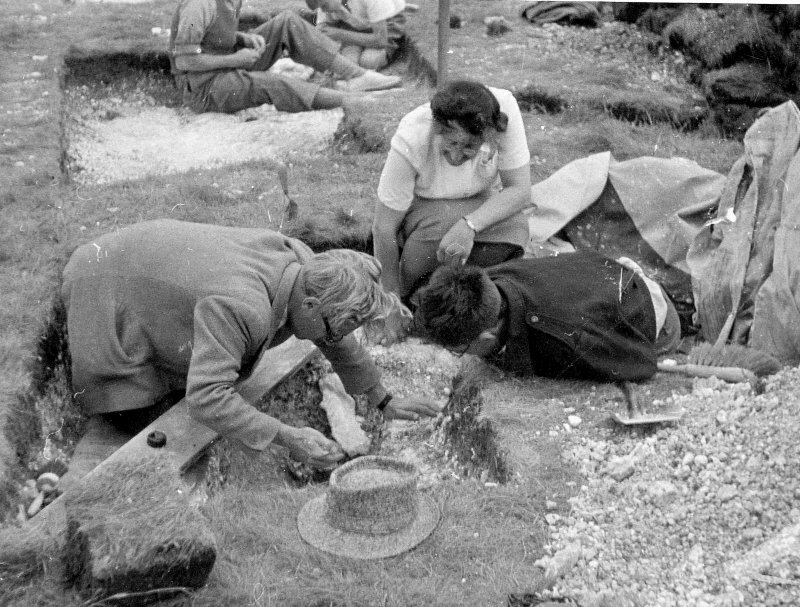 Digital copy of excavation photograph showing Hope-taylor and another excavating. 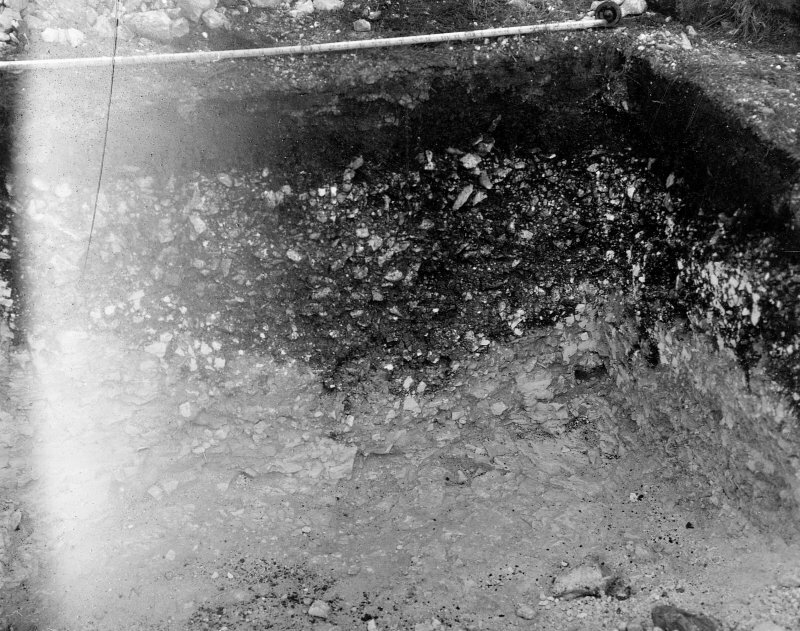 Digital copy of excavation photograph showing excavation of a single inhumation. 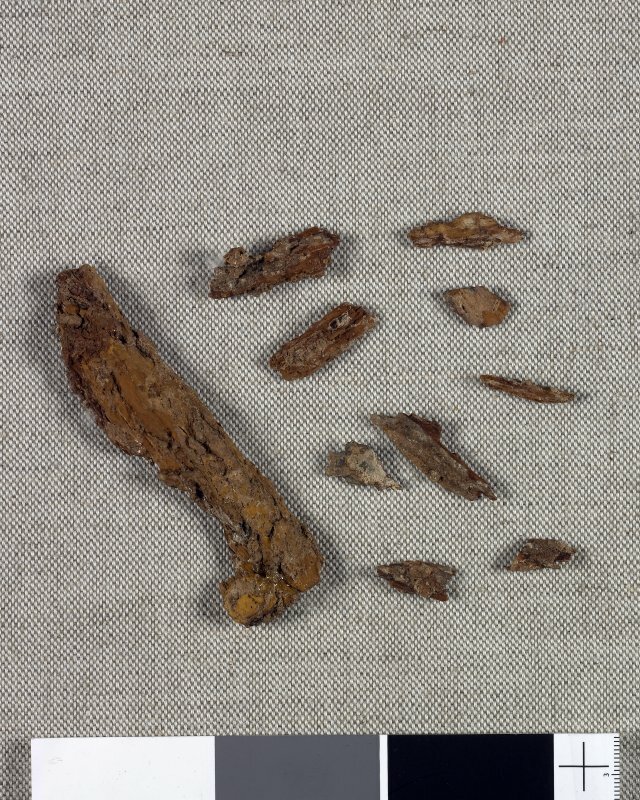 Digital copy of artefact photograph: Wood fragments from the handle of a scramasax. 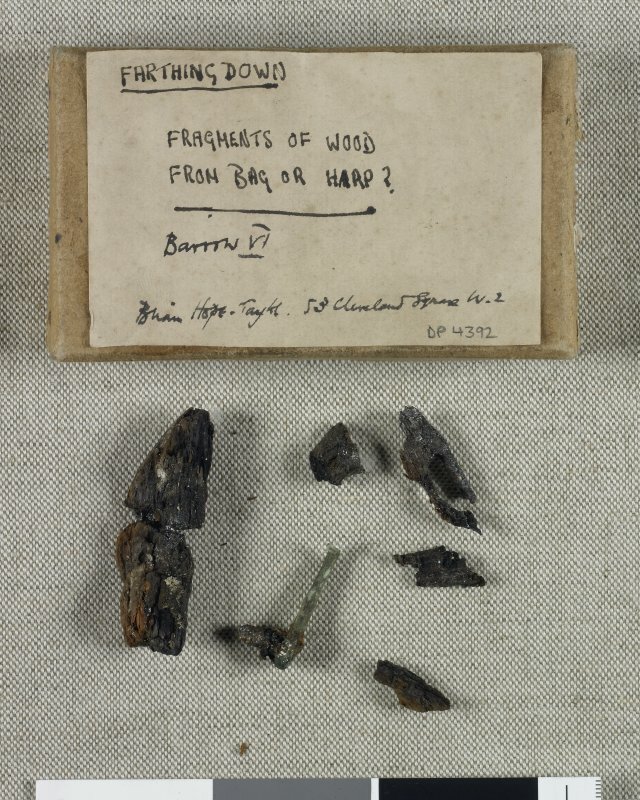 Digital copy of artefact photograph: Fragments of wood from bag or harp from Barrow VI. DC 43995. 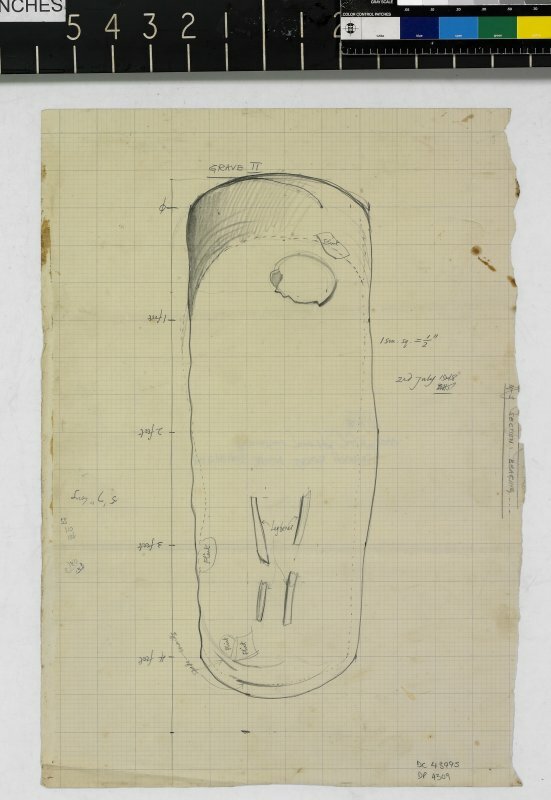 Plan of Grave II. DC 43997. 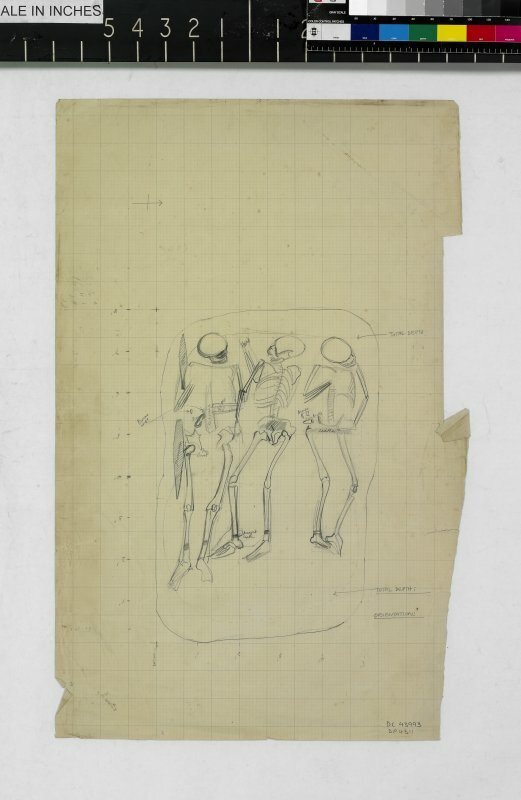 Untitled plan of grave showing location of skull and gravegoods. MS2281/28. 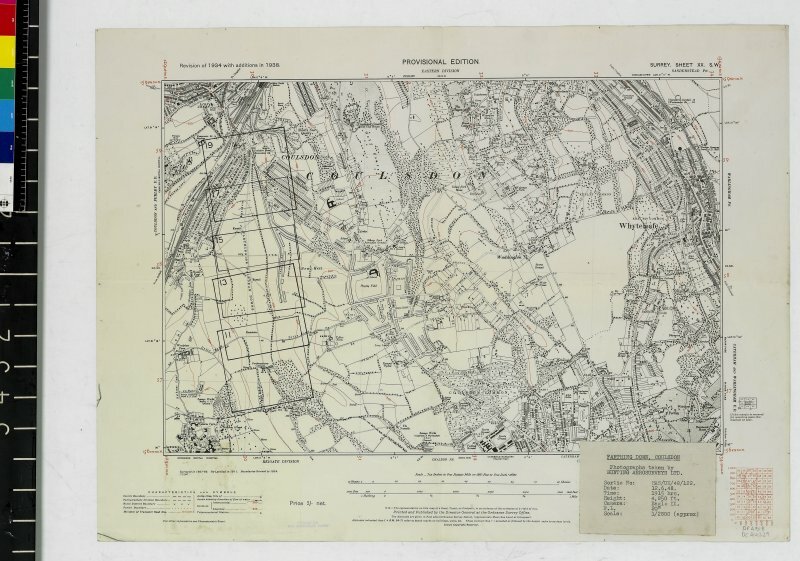 Letter and sketch map from the Archaeology Branch of the Ordnance Survey Office to Hope-Taylor regarding mapping of Farthing Down and Croham Hurst. Dated December 1945. 2 of 3 sides. S2281/24. 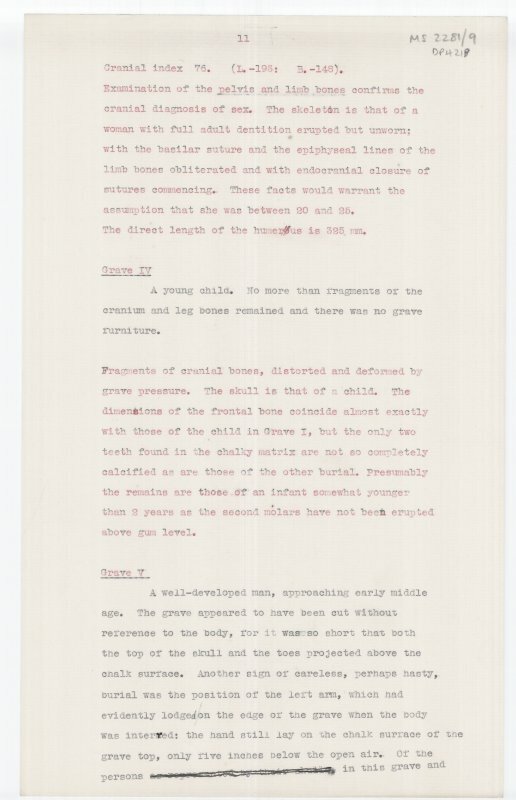 Untitled typed manuscript describing human remains by grave. 3 of 9 sides. S2281/13. 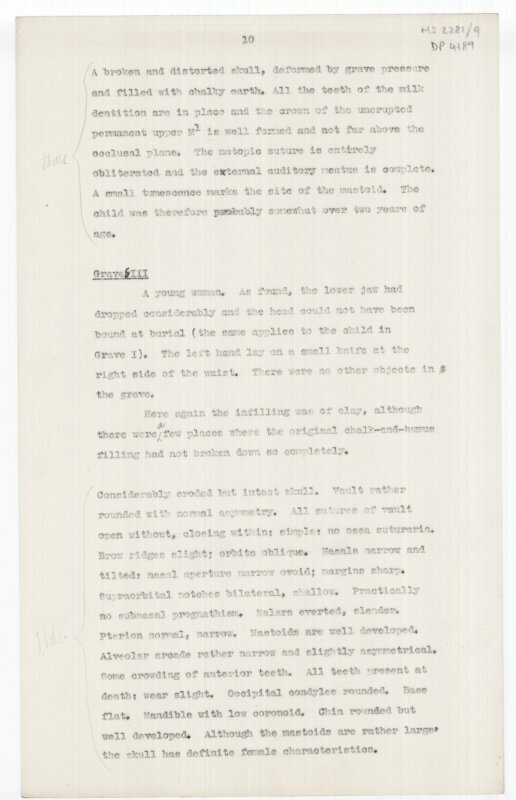 Typed manuscript entitled 'Surrey Archaeological Society. 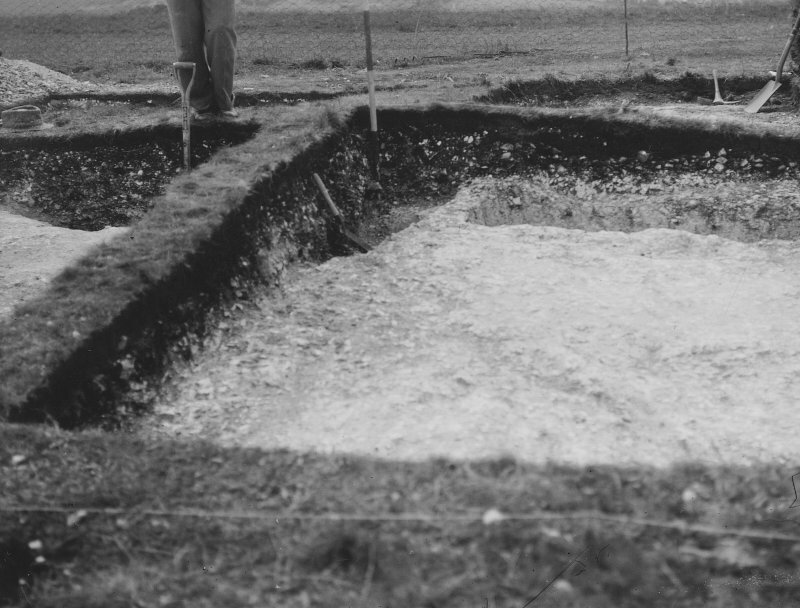 Report on archaeological excavations on Farthing Down, Coulsdon, in 1948'. 2 of 7 sides. S2281/9. 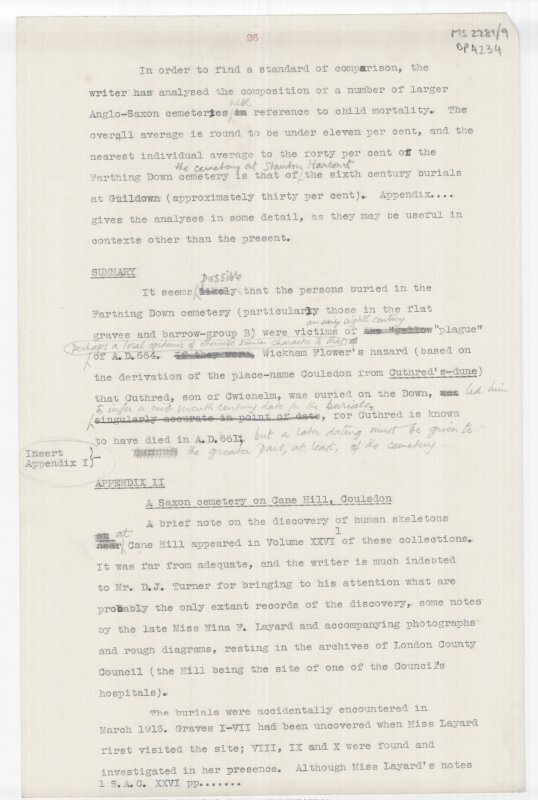 Typed manuscript with edits in pen entitled 'Excavations in the Saxon Cemetery on Farthing Down, Coulsdon'. 13 of 29 sides. S2281/9. 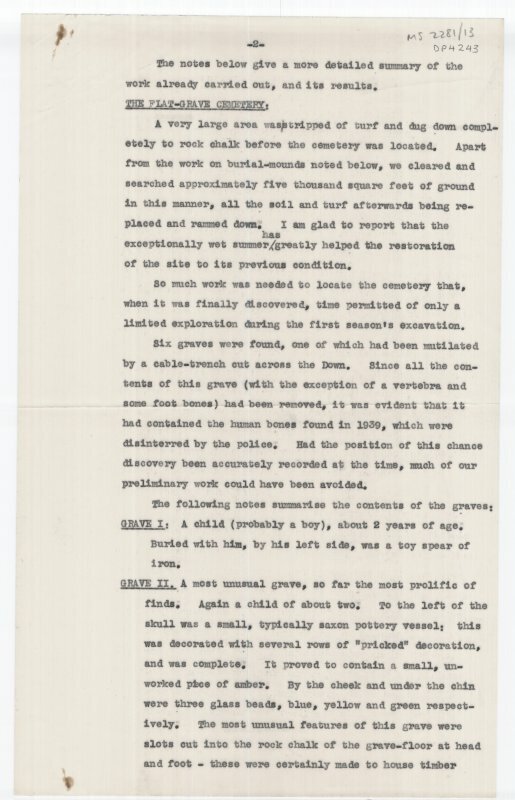 Typed manuscript with edits in pen entitled 'Excavations in the Saxon Cemetery on Farthing Down, Coulsdon'. 7 of 29 sides. S2281/9. 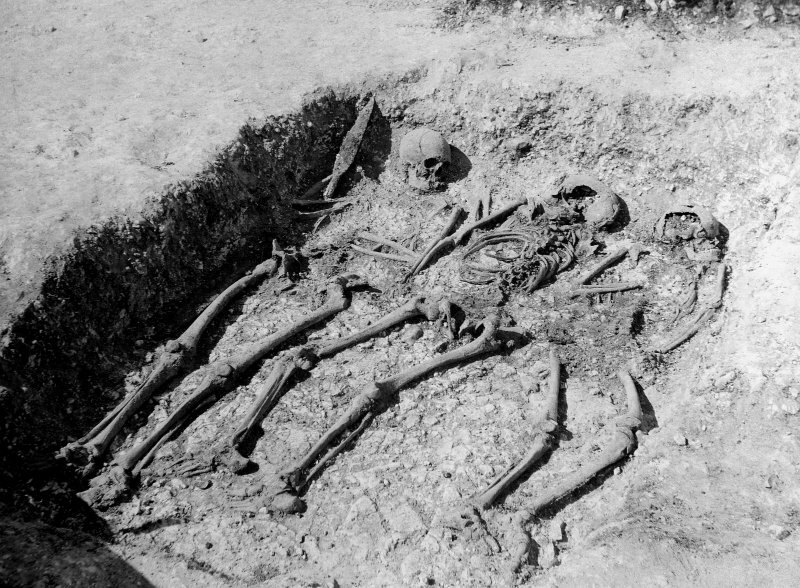 Typed manuscript with edits in pen entitled 'Excavations in the Saxon Cemetery on Farthing Down, Coulsdon'. 1 of 29 sides. S2281/9. 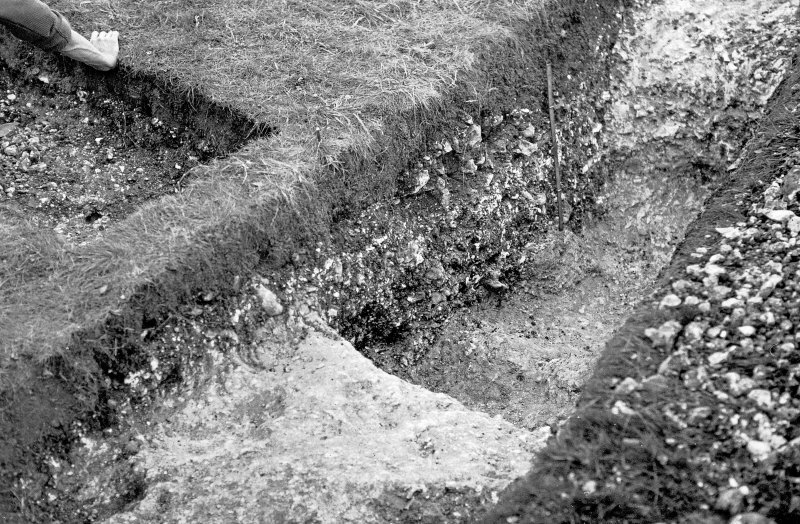 Typed manuscript with edits in pen entitled 'Excavations in the Saxon Cemetery on Farthing Down, Coulsdon'. 27 of 30 sides. MS2281/9. 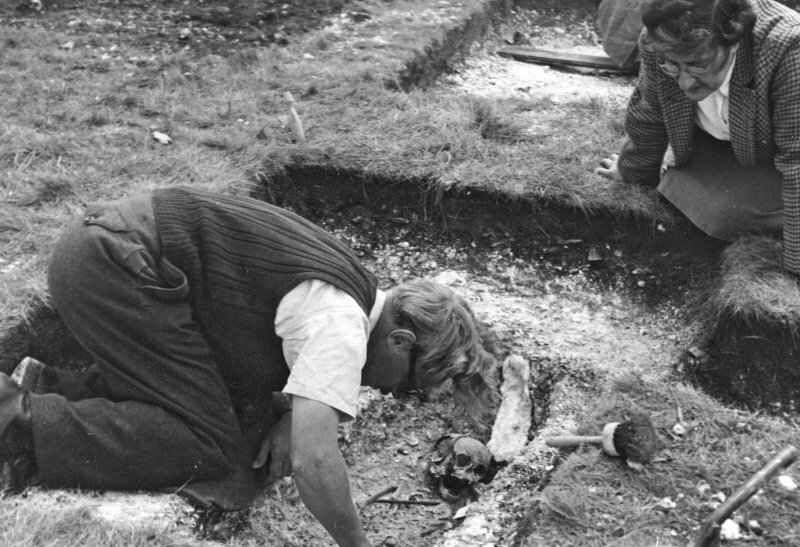 Typed manuscript with edits in pen entitled 'Excavations in the Saxon Cemetery on Farthing Down, Coulsdon'. 5 of 30 sides. MS2281/9. 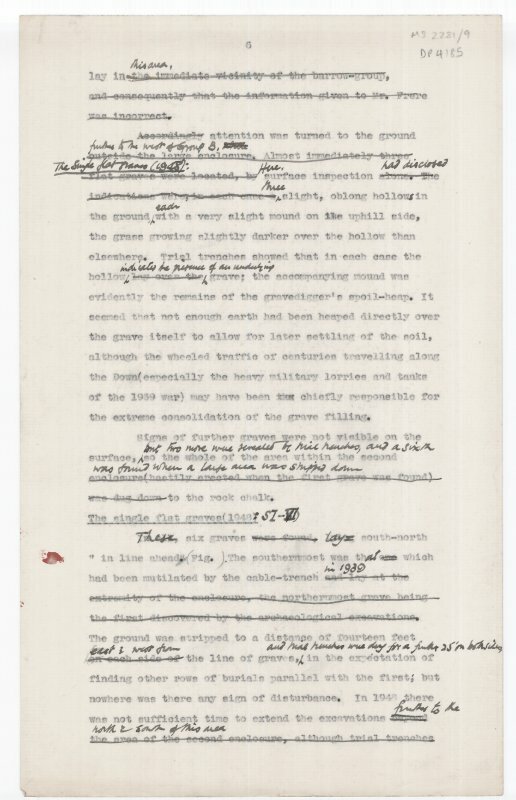 Typed manuscript with edits in pen entitled 'Excavations in the Saxon Cemetery on Farthing Down, Coulsdon'. 2 of 30 sides. 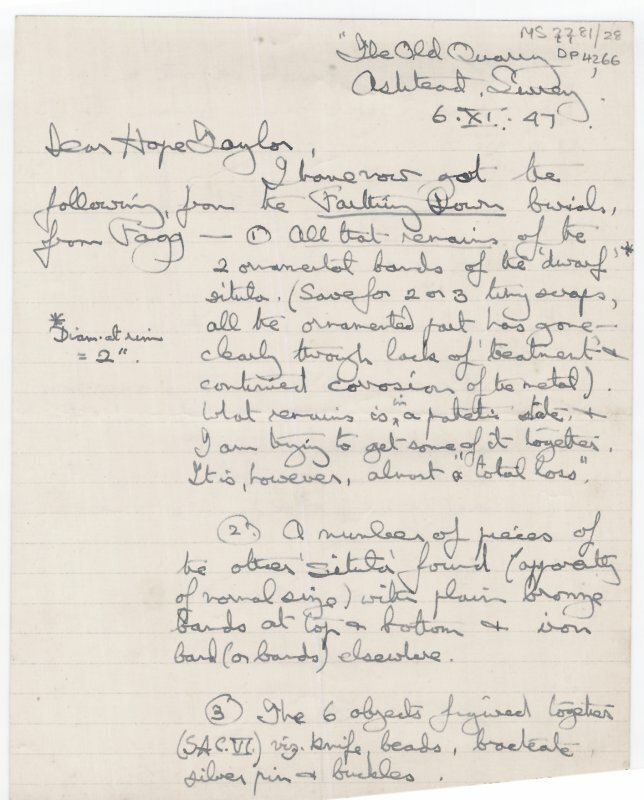 MS2281/3.Handwritten manuscript entitled 'Some unrecorded flint implements from Coulsdon and Croydon'. MS2281/25. 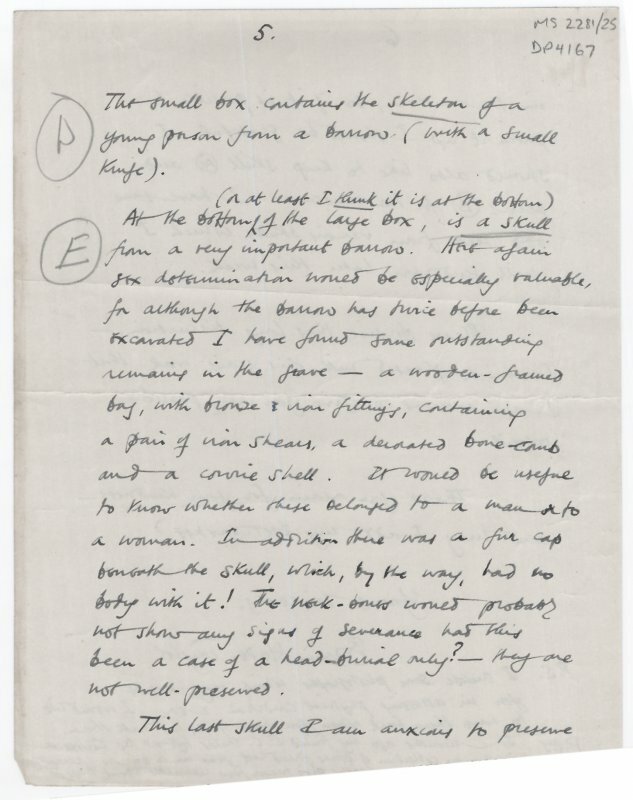 Draft of letter from Hope-taylor to Professor Wood-Jones, Royal College of Surgeons of England, intended to accompany human remains sent for identification. 1 of 6 sides. MS2281/33. 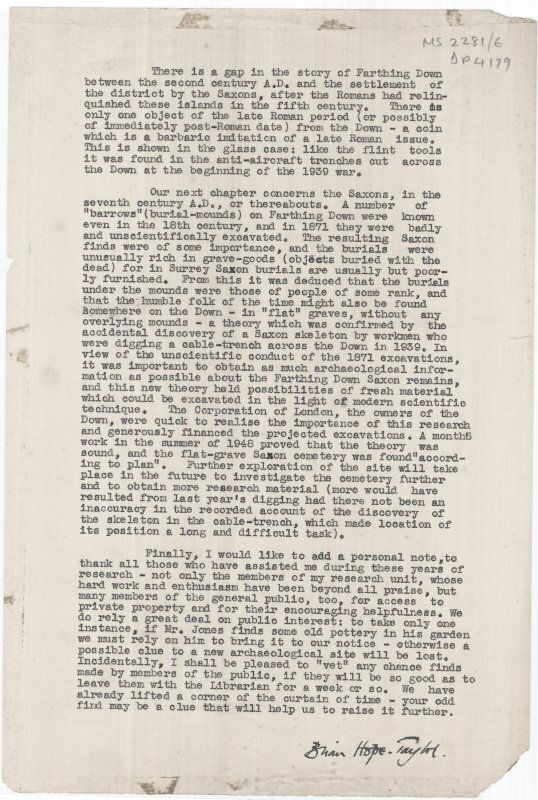 Handwritten draft of a letter to The Urban District Council of Coulsdon and Purley entitled 'Archaeological excavations on Farthing Down, Coulsdon, Surrey'. 4 of 4 sides. MS2281/02. 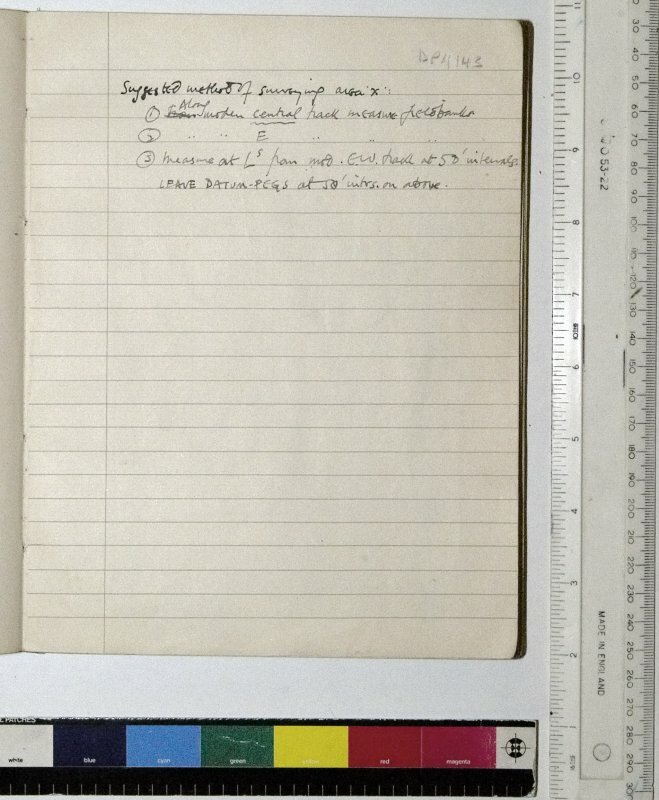 Untitled site notebook. 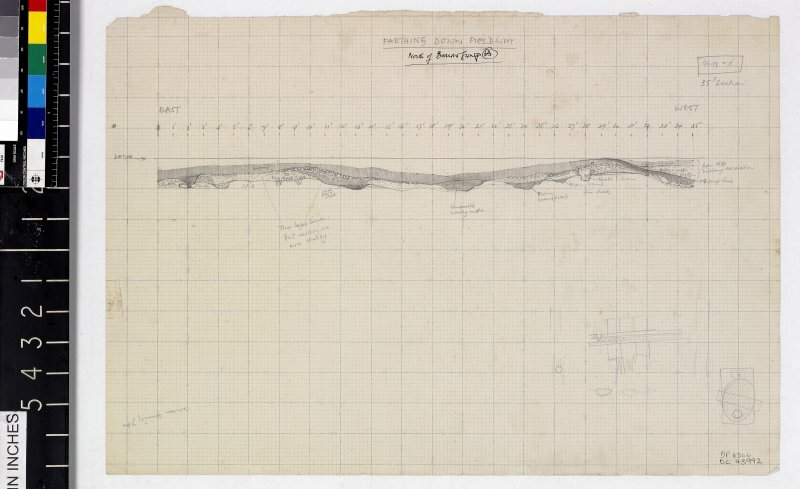 Sketch showing field boundaries. 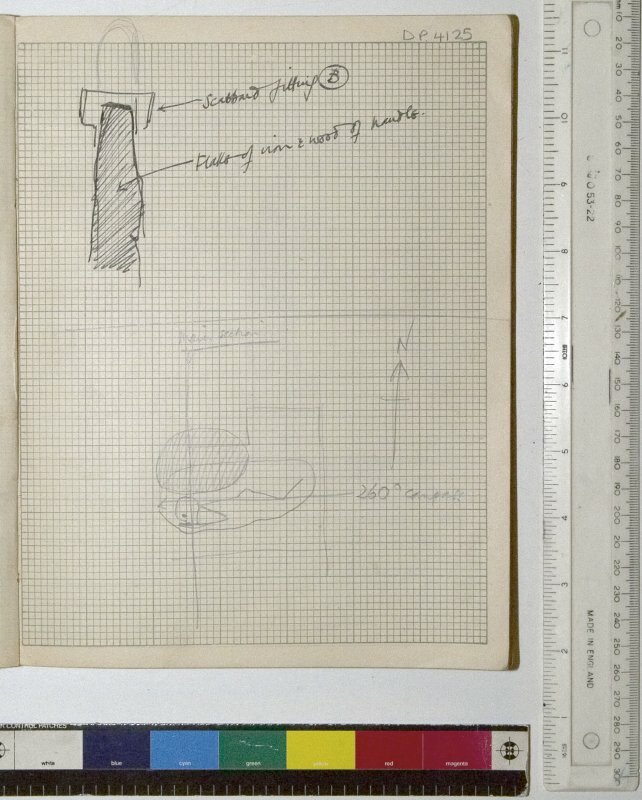 MS 2281/1.Site Notebook entitled 'Farthing Down '48/'49'. Sketch and measurements showing depth of triple grave from the top of the chalk level. 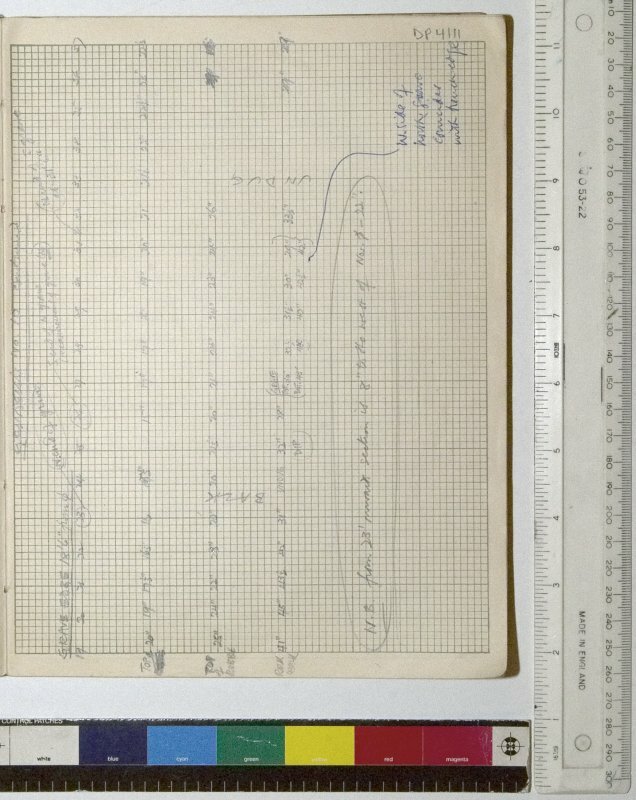 MS 2281/1.Site Notebook entitled 'Farthing Down '48/'49'. 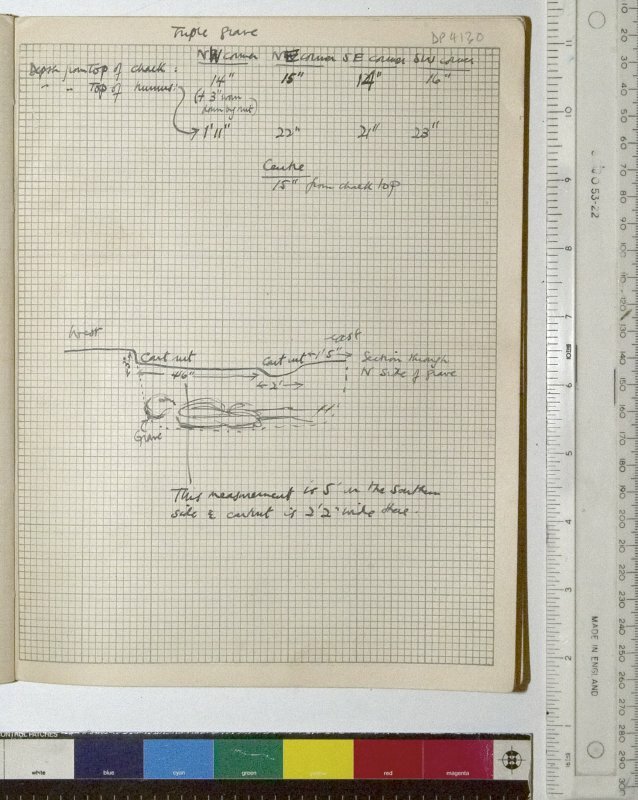 Sketches of an iron sword and single burial. 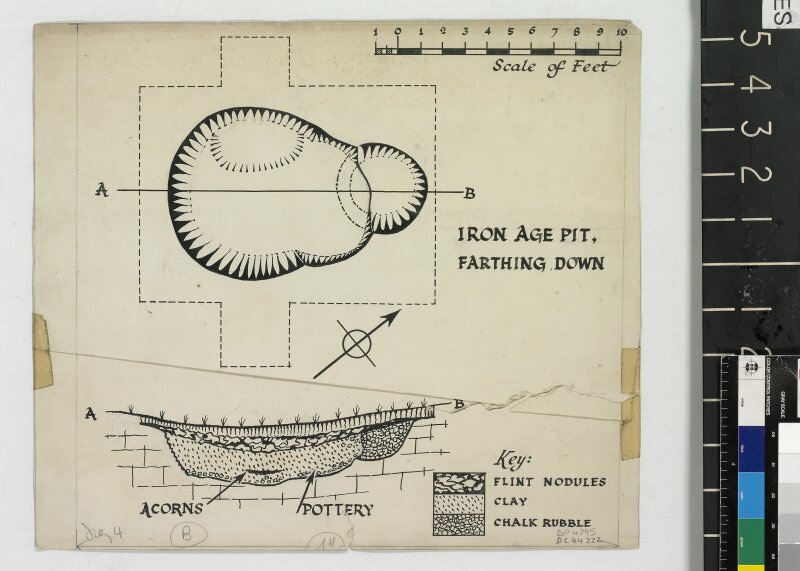 MS 2281/1.Site Notebook entitled 'Farthing Down '48/'49'. 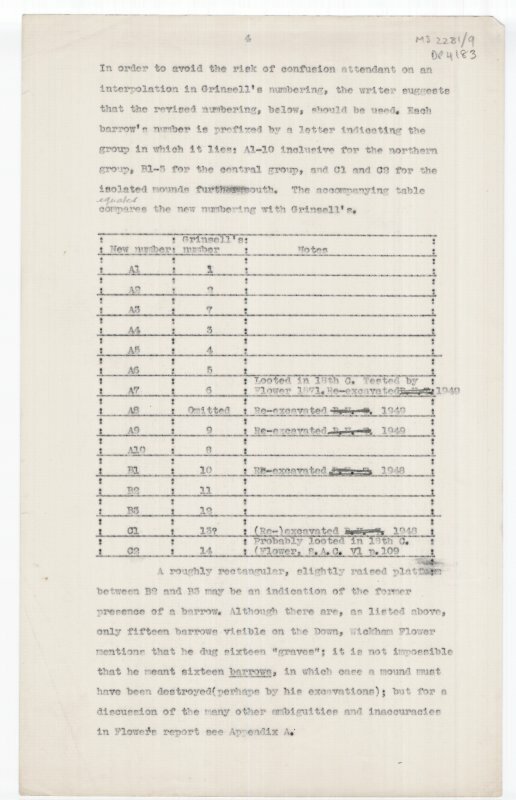 Notes on orientation of Grave I. Continued in DP4122. 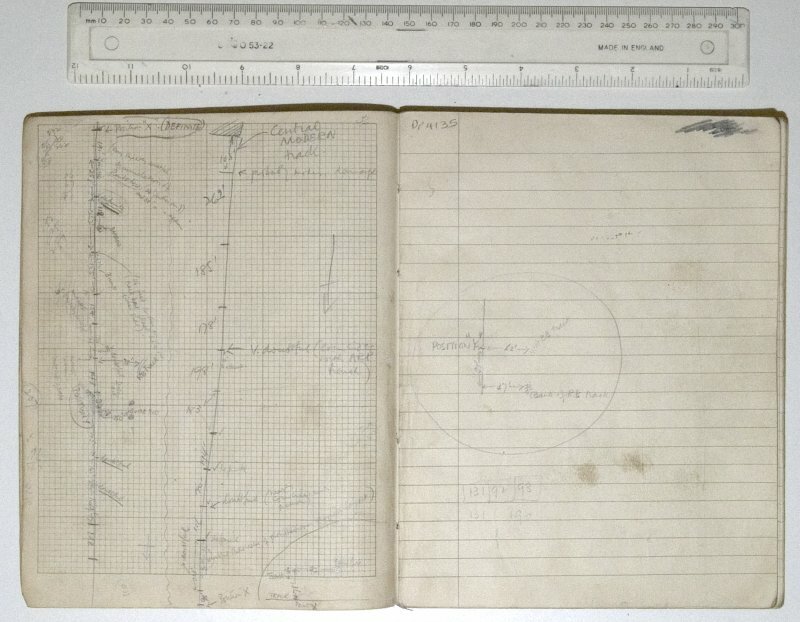 MS 2281/1.Site Notebook entitled 'Farthing Down '48/'49'. 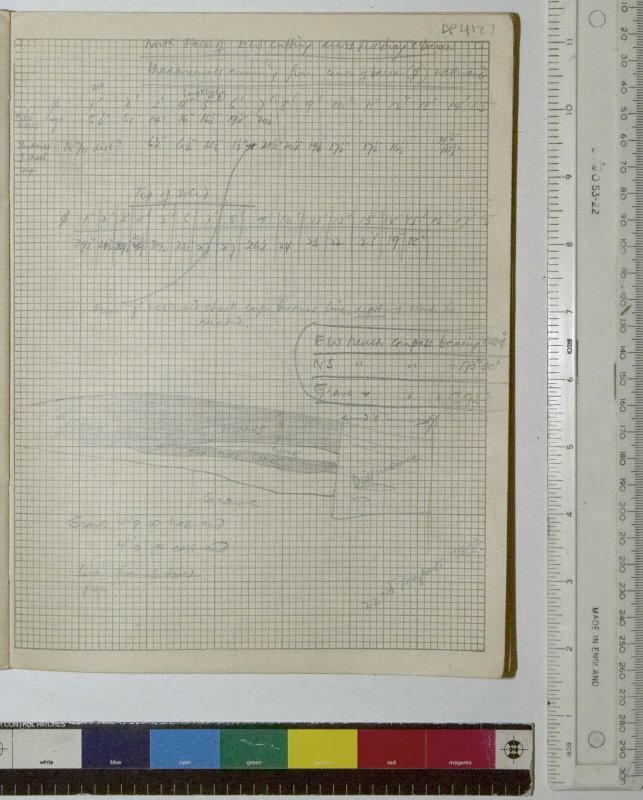 Measurements for section through Grinsell's Barrow 10 (B1), N-S section. Continued from DP4113 and DP4414. 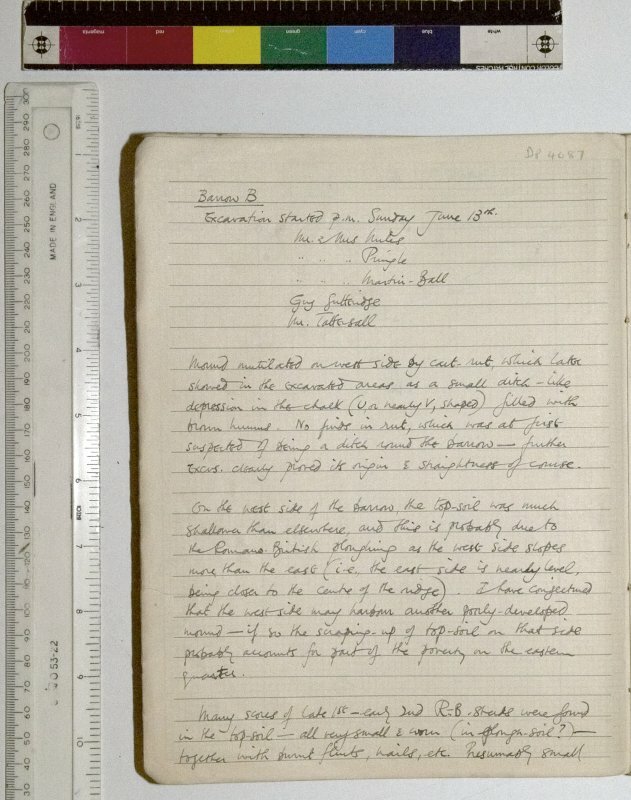 MS 2281/1.Site Notebook entitled 'Farthing Down '48/'49'. Measurements for section through Grinsell's Barrow 10 (B1), N-S section. Continued from DP4110. MS 2281/1.Site Notebook entitled 'Farthing Down '48/'49'. Depths and levels of strata identified in Quadrant A, North Section. 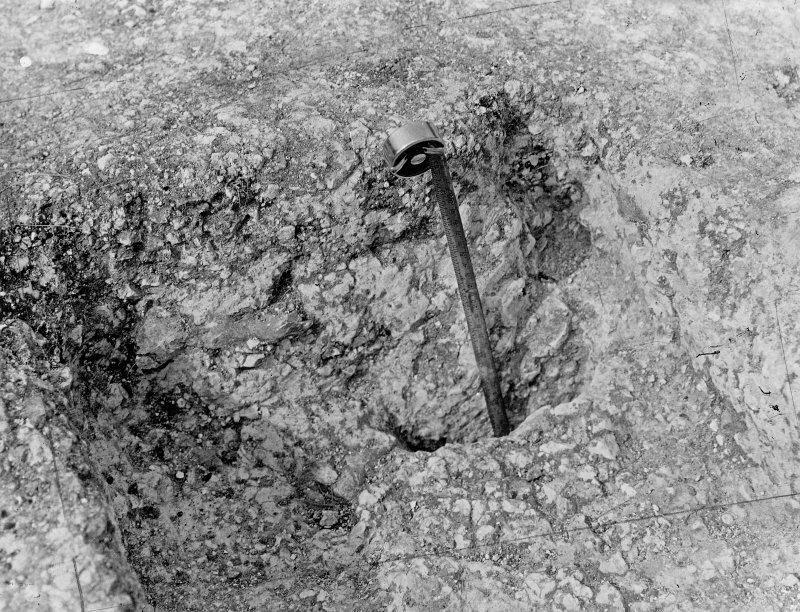 Digital copy of excavation photograph of Grave VII. 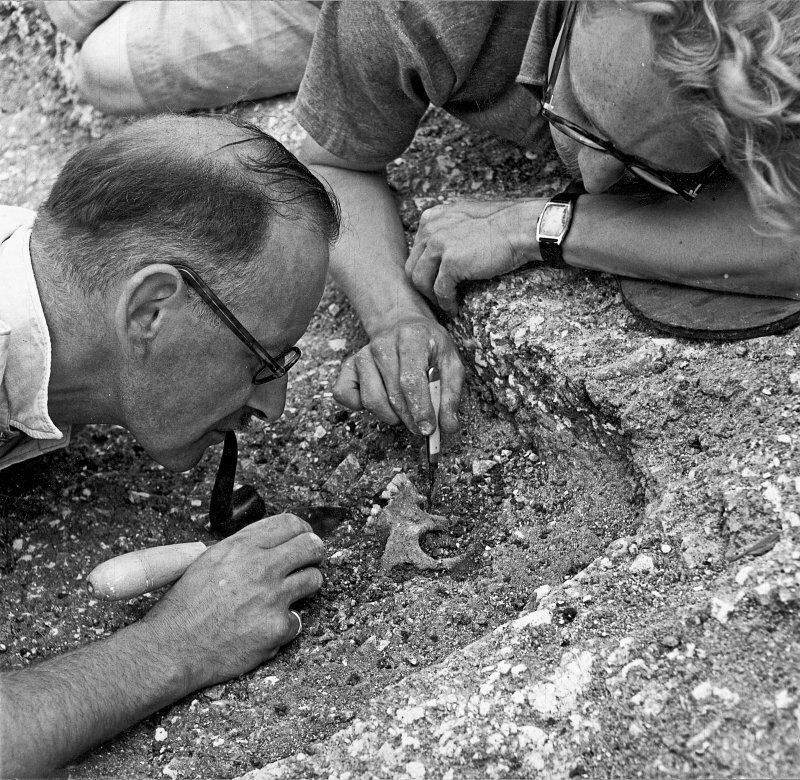 Digital copy of excavation photograph of Hope-Taylor and another excavating a skull. 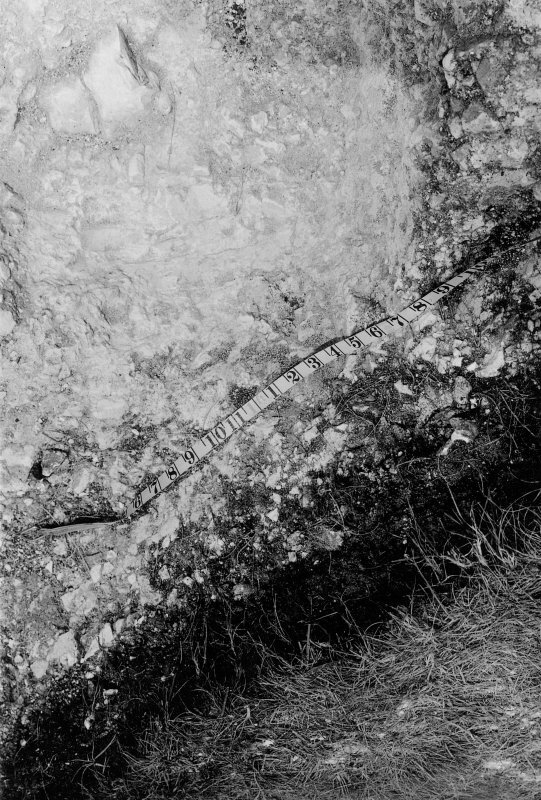 Digital copy of excavation photograph: detail of trench. 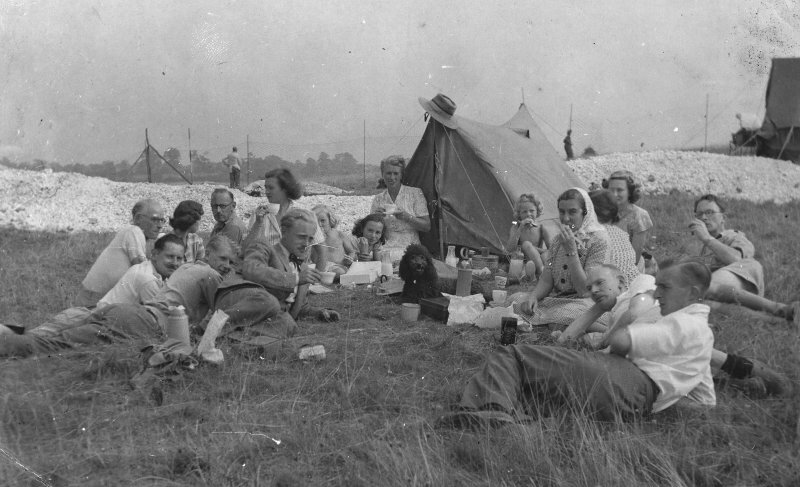 Digital copy of excavation photograph showing excavation team during a break. S2281/28. 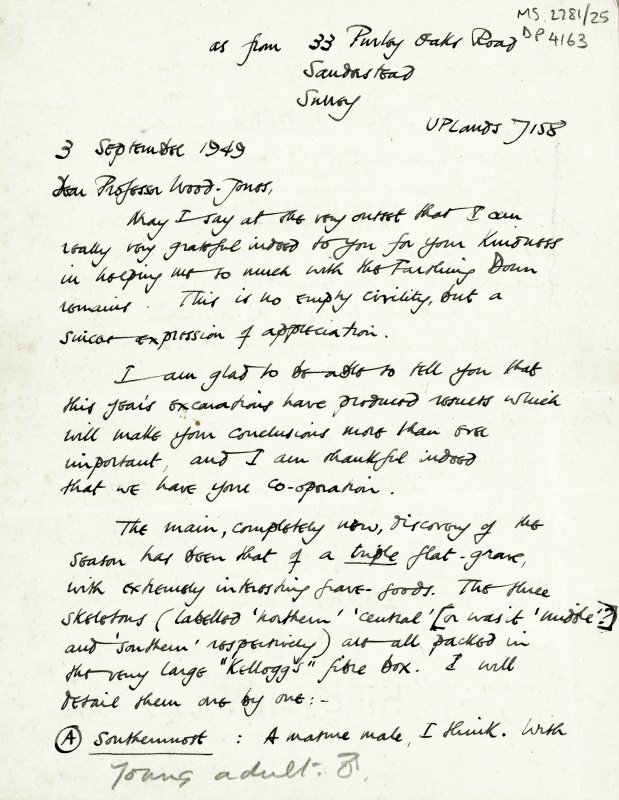 Letter from A Lowther to Hope-Taylor regard finds from Farthing Down recovered before Hope-Taylor's excavations. Dated 6. 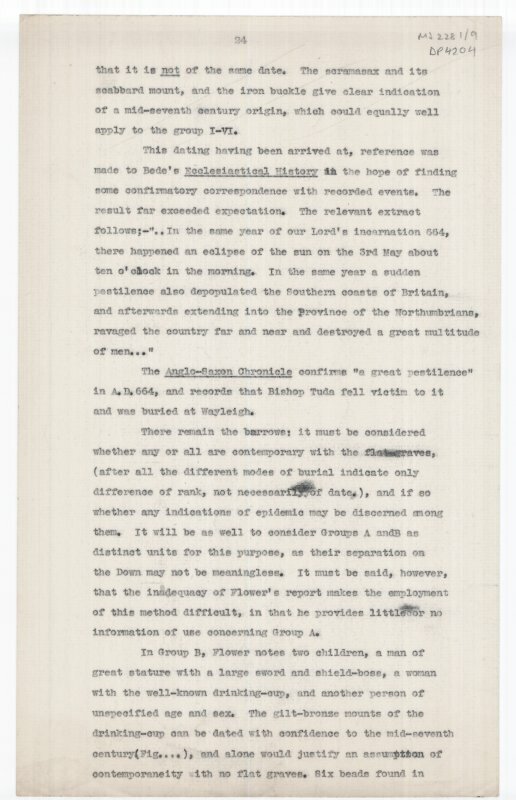 XI.47. 1 of 2 sides. S2281/24. 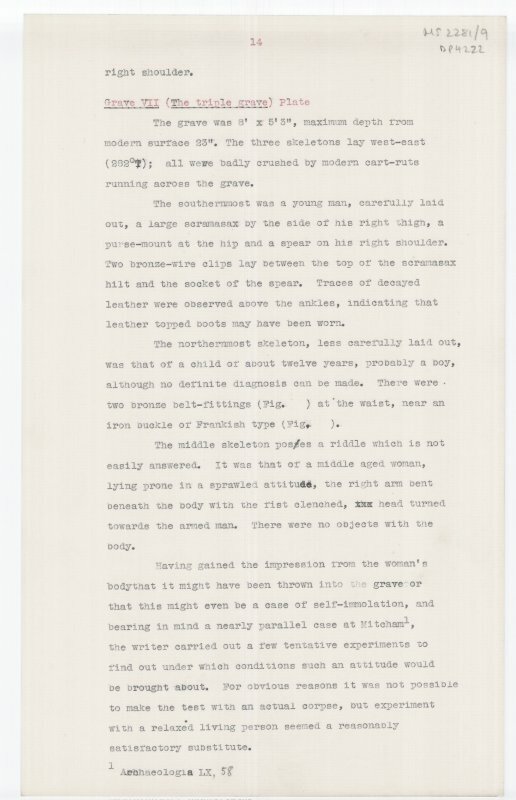 Untitled typed manuscript describing human remains by grave. 5 of 9 sides. S2281/24. 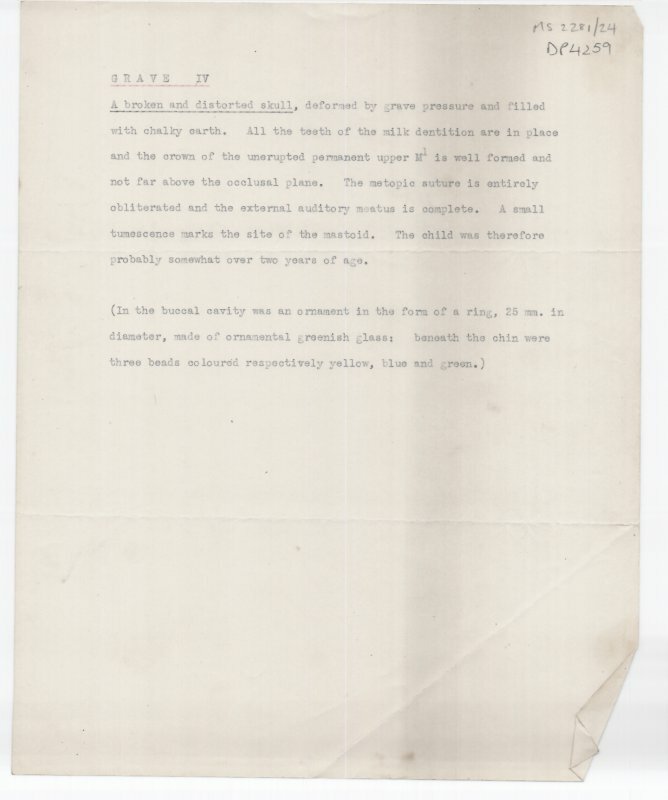 Untitled typed manuscript describing human remains by grave. 1 of 9 sides. S2281/15. 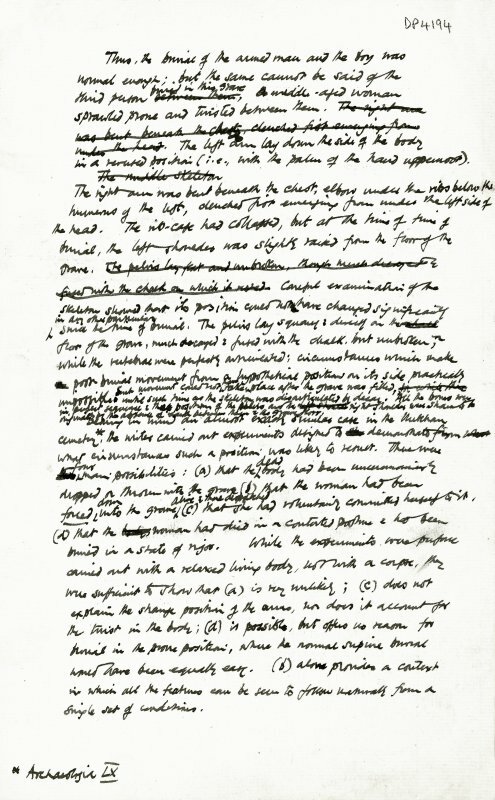 Handwritten manuscript entitled 'Topography and history of the site'. 1 of 2 sides. S2281/14. 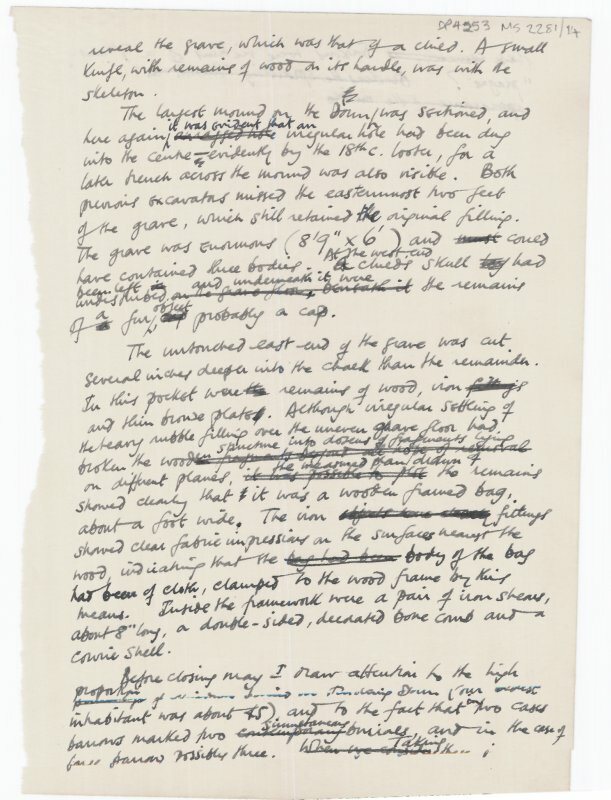 Handwritten manuscript entitled 'Article for the Archaeological Newsletter. 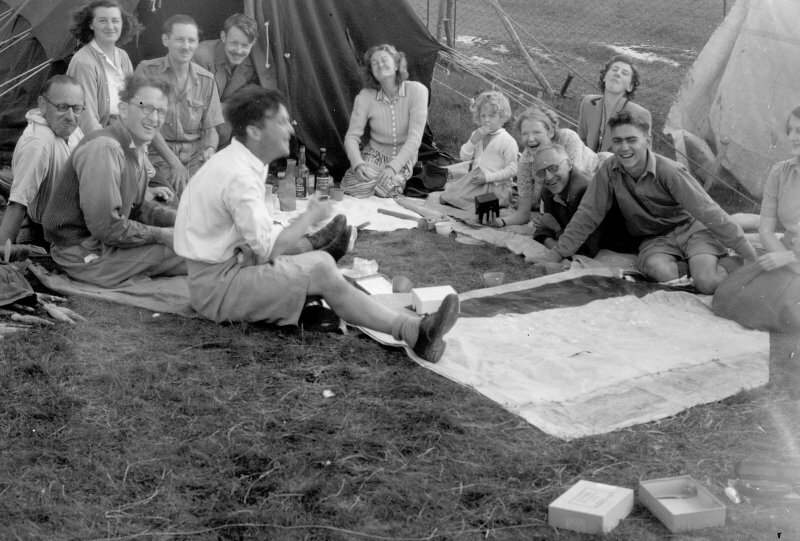 September 1949'. 5 of 6 sides. S2281/13. 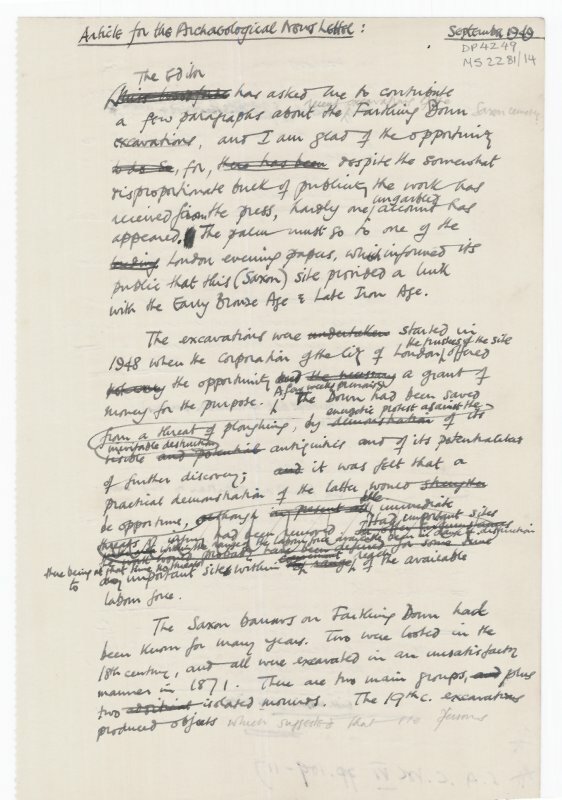 Typed manuscript entitled 'Surrey Archaeological Society. 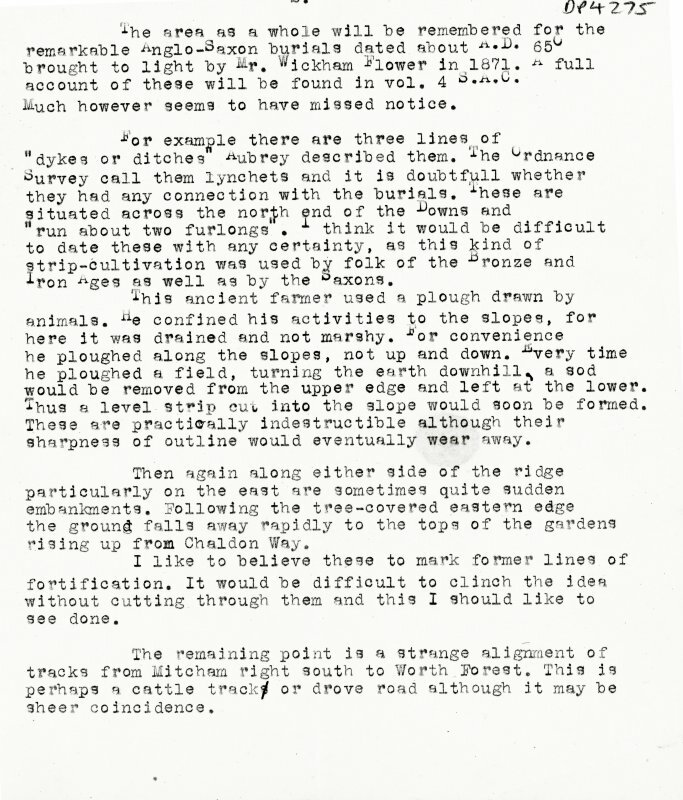 Report on archaeological excavations on Farthing Down, Coulsdon, in 1948'. 6 of 7 sides. S2281/9. 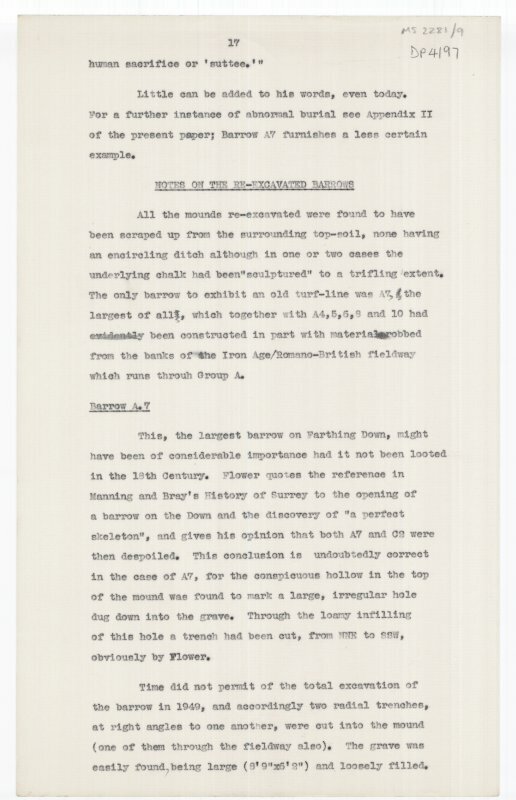 Typed manuscript with edits in pen entitled 'Excavations in the Saxon Cemetery on Farthing Down, Coulsdon'. 26 of 29 sides. S2281/9. 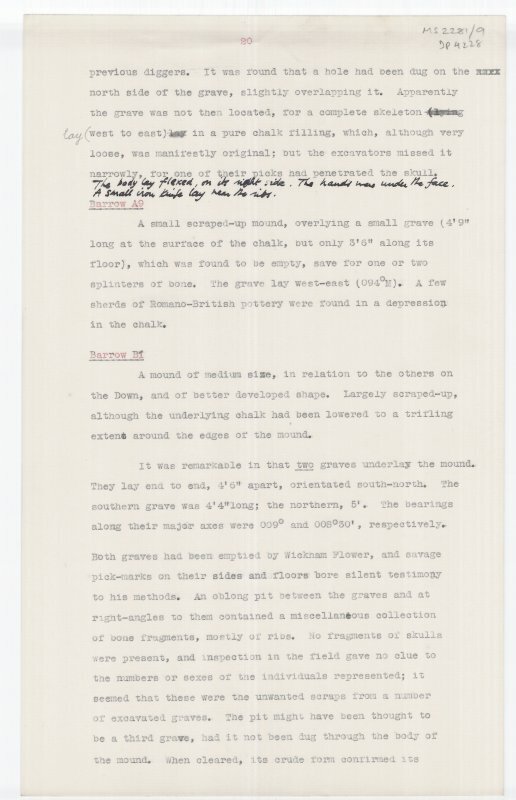 Typed manuscript with edits in pen entitled 'Excavations in the Saxon Cemetery on Farthing Down, Coulsdon'. 14 of 29 sides. S2281/9. 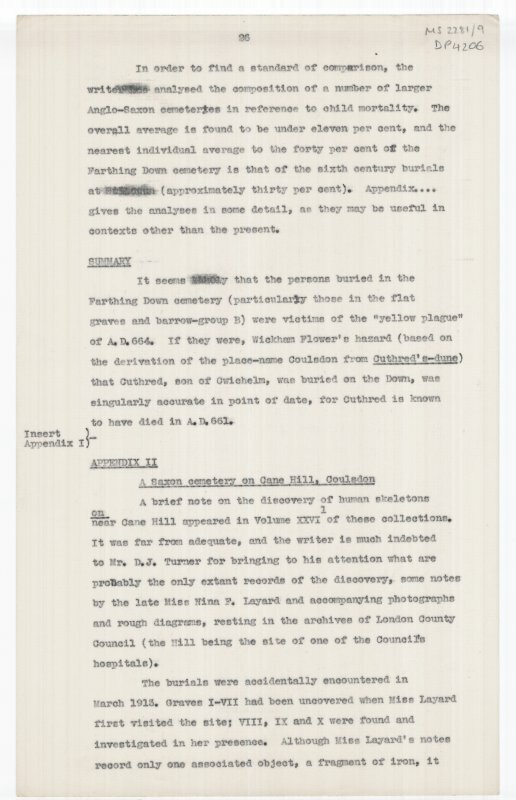 Typed manuscript with edits in pen entitled 'Excavations in the Saxon Cemetery on Farthing Down, Coulsdon'. 28 of 30 sides. S2281/9. 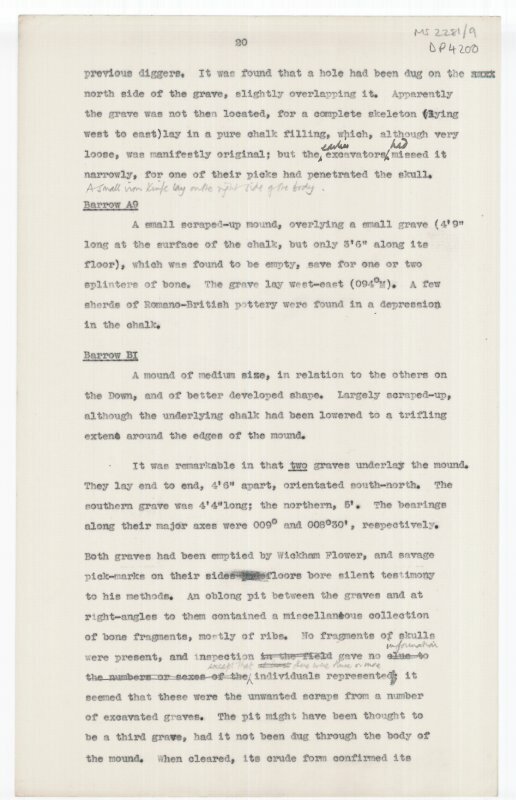 Typed manuscript with edits in pen entitled 'Excavations in the Saxon Cemetery on Farthing Down, Coulsdon'. 25 of 30 sides. S2281/9. 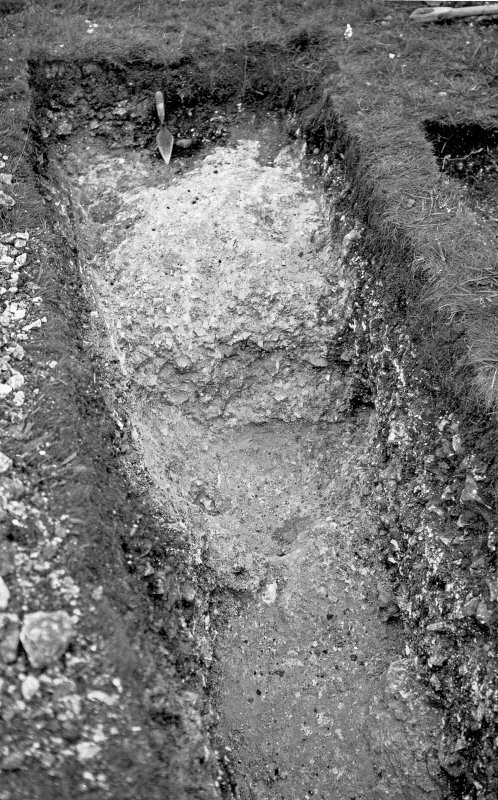 Typed manuscript with edits in pen entitled 'Excavations in the Saxon Cemetery on Farthing Down, Coulsdon'. 24 of 30 sides. S2281/9. 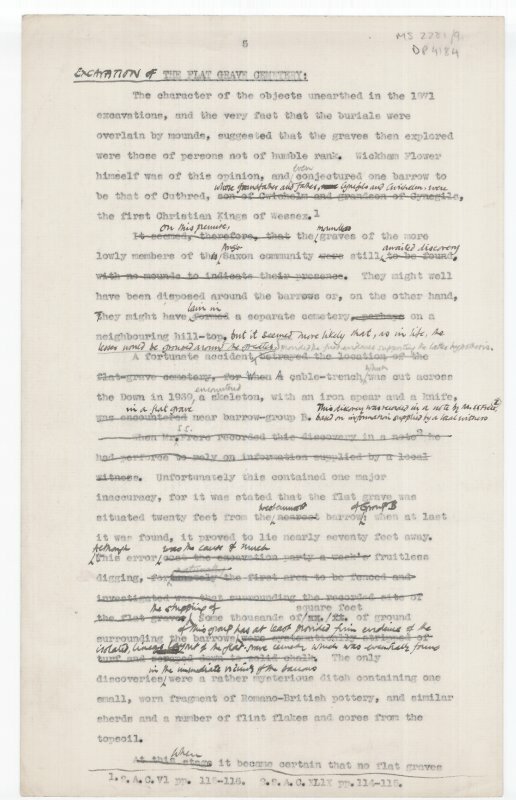 Typed manuscript with edits in pen entitled 'Excavations in the Saxon Cemetery on Farthing Down, Coulsdon'. 15 of 30 sides. MS2281/9. 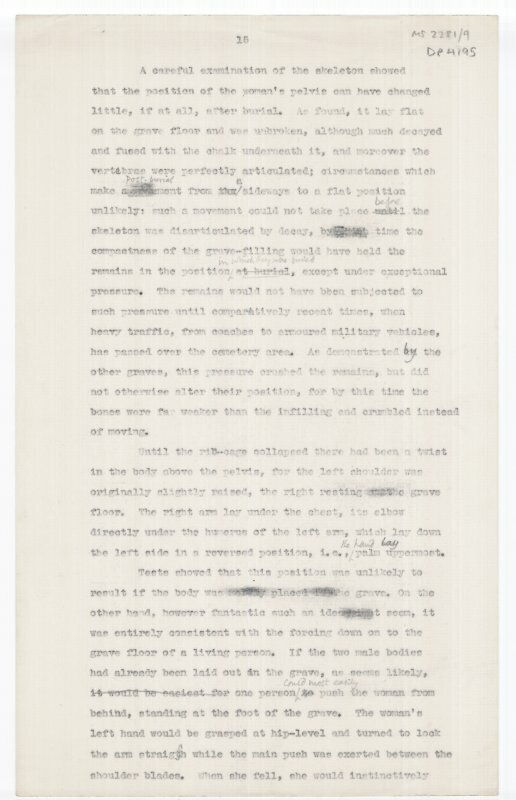 Typed manuscript with edits in pen entitled 'Excavations in the Saxon Cemetery on Farthing Down, Coulsdon'. 4 of 30 sides. MS2281/9. 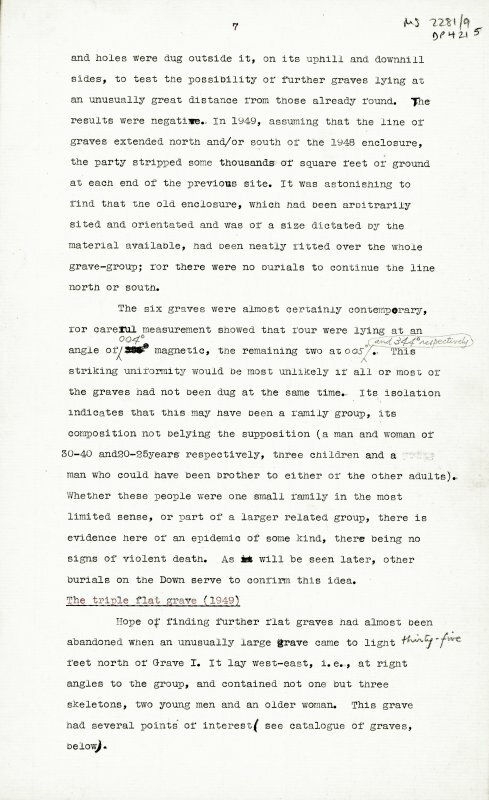 Typed manuscript with edits in pen entitled 'Excavations in the Saxon Cemetery on Farthing Down, Coulsdon'. 3 of 30 sides. MS2281/9. 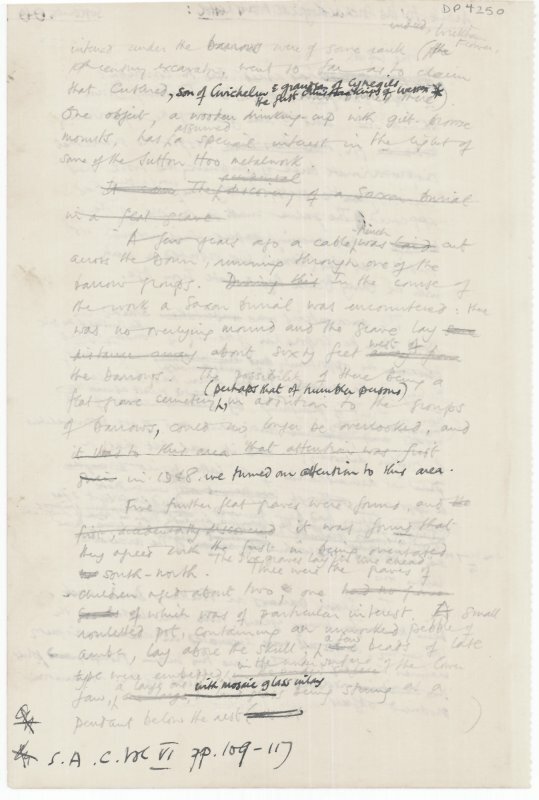 Typed manuscript with edits in pen entitled 'Excavations in the Saxon Cemetery on Farthing Down, Coulsdon'. 1 of 30 sides. MS2281/6. 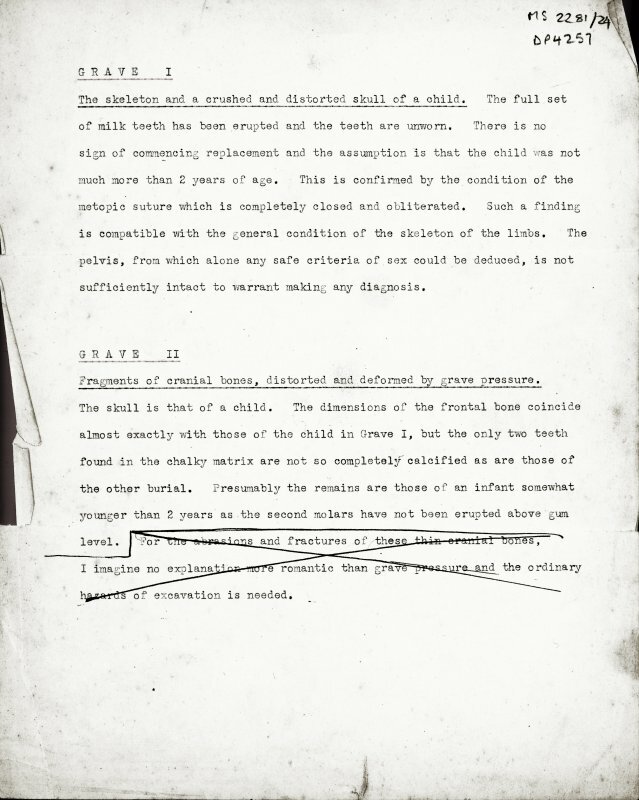 Untitled typed manuscript designed to preface an exhibition of material from Farthing Down. 1 of 2 sides. MS2281/25. 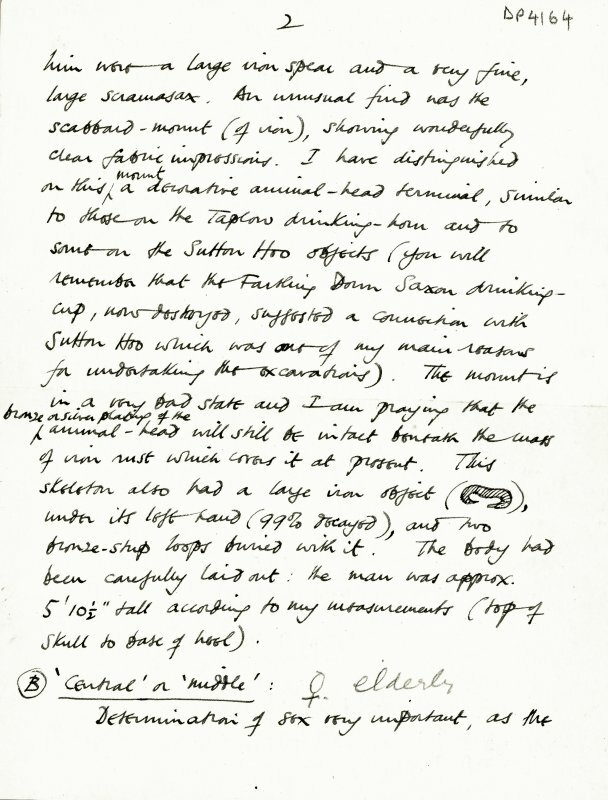 Draft of letter from Hope-taylor to Professor Wood-Jones, Royal College of Surgeons of England, intended to accompany human remains sent for identification. 2 of 6 sides. MS2281/33. 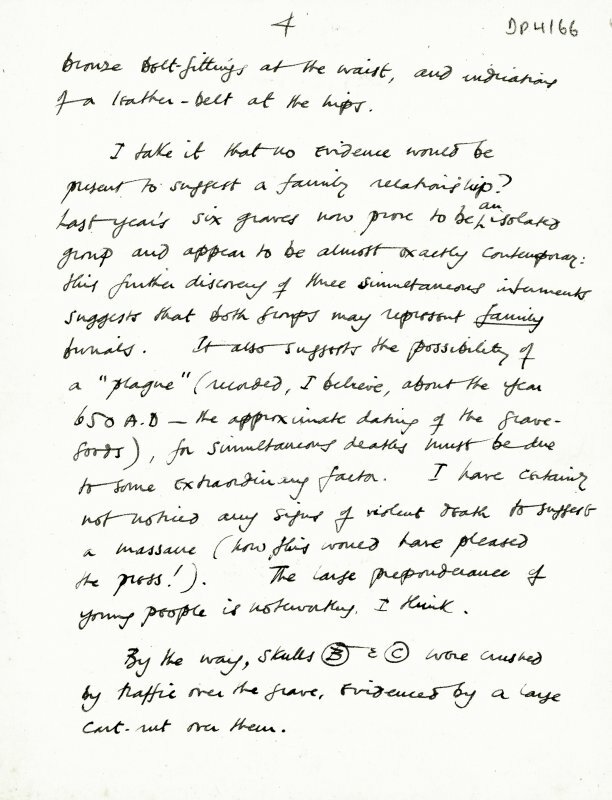 Handwritten draft of a letter to the Surrey Archaeological Society regarding the exhibition of finds from the 1948 excavations'. 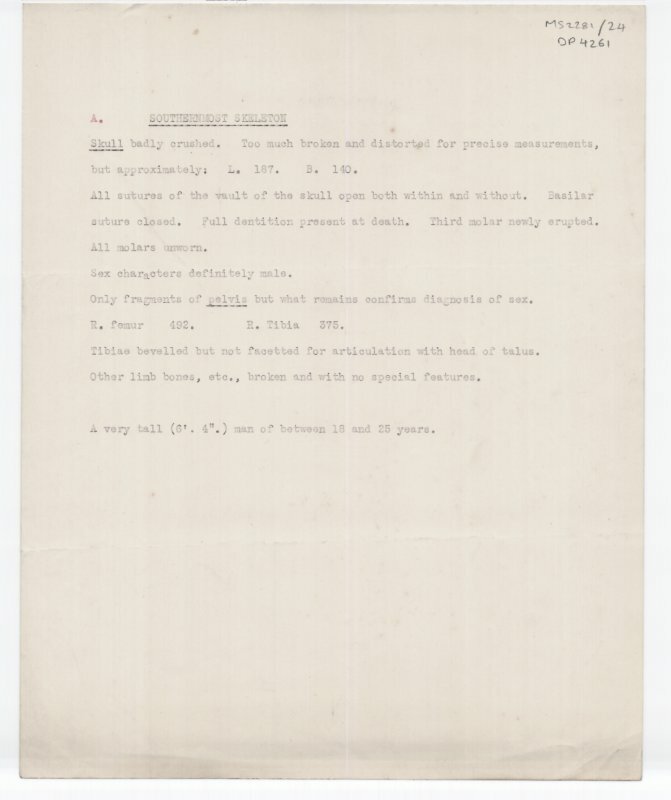 Includes plan for the exhibition. 2 of 3 sides. MS2281/32. 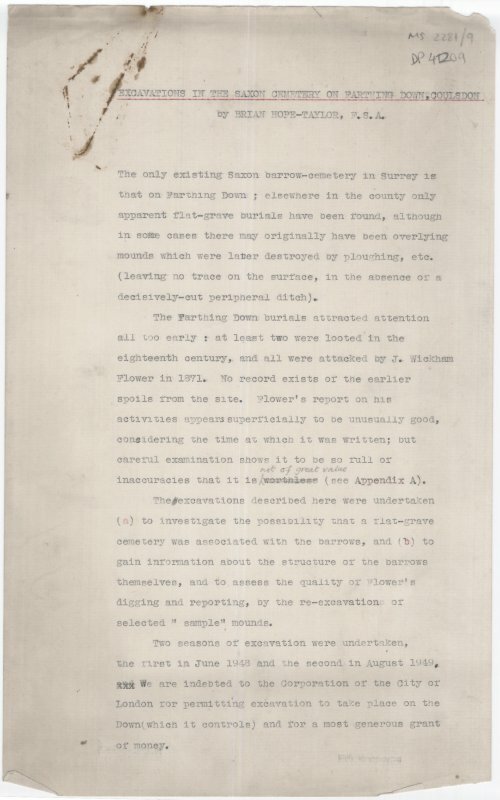 Typed manuscript entitled 'Archaeological excavations on Farthing Down, Coulsdon, Surrey'. 1 of 3 sides. 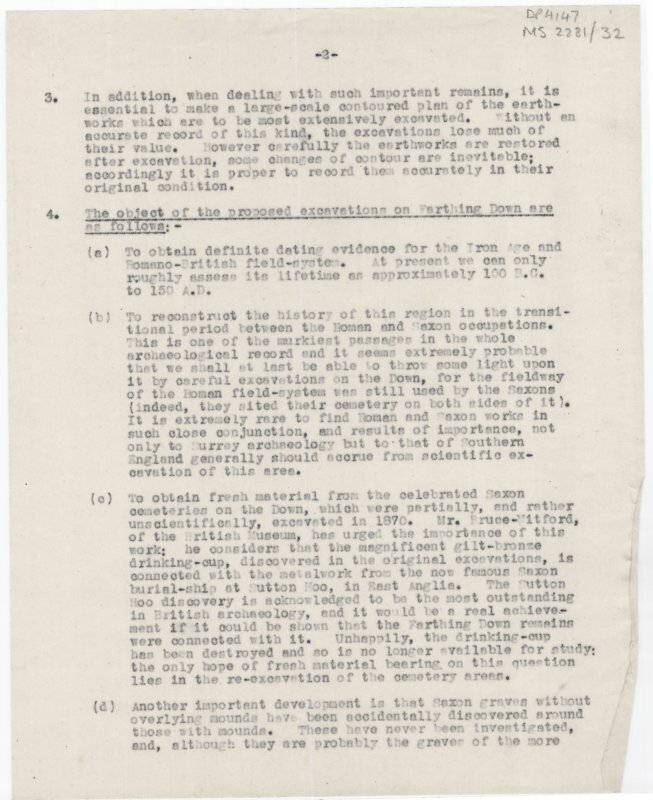 MS 2281/1.Site Notebook entitled 'Farthing Down '48/'49'.Notes on Orientaions of Barrow 10 and Graves III and V.
MS 2281/1.Site Notebook entitled 'Farthing Down '48/'49'. 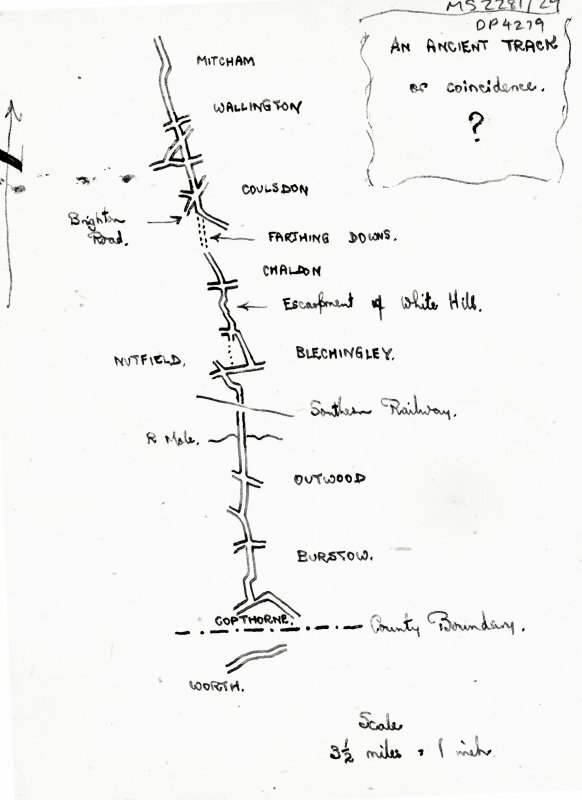 Sketch showing location of Barrow C1. 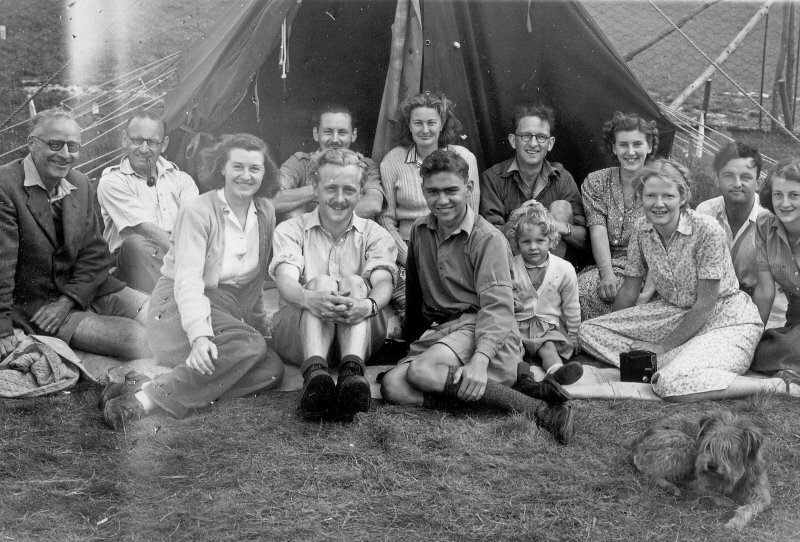 Digital copy of excavation photograph: excavation team photograph. 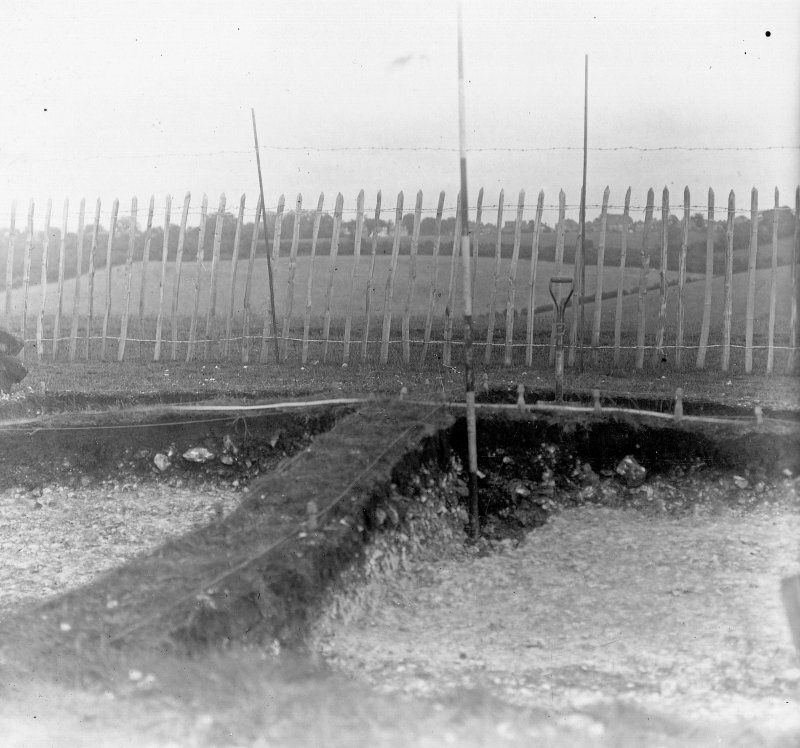 Digital copy of excavation photograph: view of trenches. 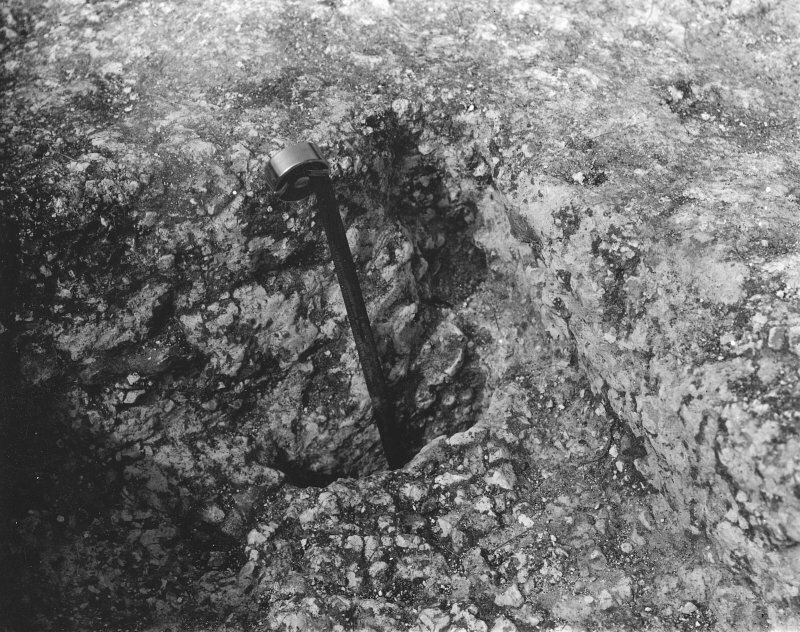 Digital copy of view of iron knife from burial, excavations by Brian Hope-Taylor 1948-49.